A return to Mill Hill in glorious clear blue skies on Friday produced 5 Clouded Yellow (3 males flying together), a slightly tatty Peacock and a Small Tortoiseshell. "Mill Hill through the Seasons"
A distinct chill (just above freezing) in the morning but weak sunshine in the afternoon which encouraged a Red Admiral Butterfly to leave the Ivy on the southern part of Mill Hill, and a Clouded Yellow to flutter rapidly over the lower slopes, where a Dropwort was seen in flower. The Clouded Yellow was probably a mating pair in flight? At least three Common Darters (dragonfly) showed. A Kestrel hovered above the plateau in the fading light. At midday I headed off to Mill Hill where we counted at least 10 Clouded Yellow (some in fresh condition) several Red Admiral and a Large White, all photographed. NB: This was the first recorded local Large White in November. 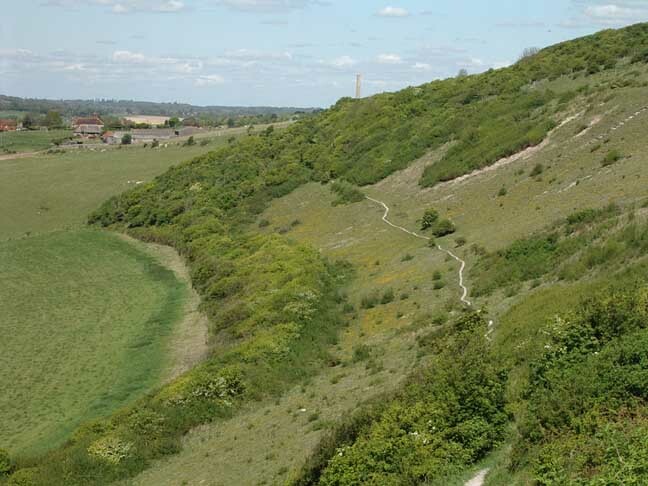 There was very little that moved and not much colour on Mill Hill: two scurrying Mice underneath a piece of wood, and three Clouded Yellow Butterflies were spotted restlessly fluttering over the lower slopes. I caught a glimpse of one visiting a Wild Basil flower. I made a note of a few other flowers on the lower slopes: Lesser Hawkbit, Rough Hawkbit, Dandelion, an unidentified small plant unknown possibly a Sow Thistle (that looked like but wasn't Nipplewort), small Common Ragwort plants, Yellow Wort, and Common Centaury with one Lesser Knapweed. The dead heads of Carline Thistle and Ploughman's Spikenard and a handful of the spikes of Great Mullein were evident but not so much of usual because of the extensive Privet shearing removed all the other tall plants as well. The upper part and rough meadows added Bramble, Hogweed, Melilot, Greater Knapweed, Hawkweed Ox-tongue and Creeping Thistle. 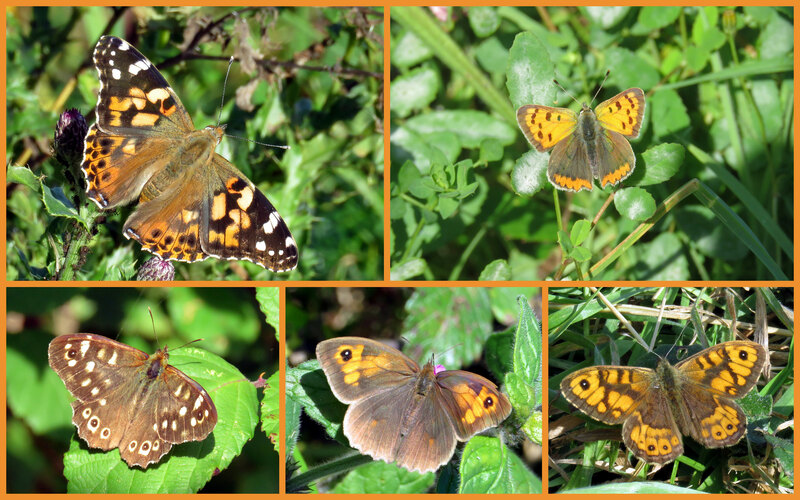 There were only four species of butterfly on Mill Hill in the afternoon sunshine, but then it was nearing the end of autumn. The first of five Red Admirals visited Ivy on the southern upper part of Mill Hill Nature Reserve, which had recently forage harvested (shorn of surface vegetation, grasses etc.). They were accompanied by a Comma Butterfly high up amongst the Old Man's Beard. Down on the lower slopes the unwelcome Privet had also been shorn (hopefully without damaging the butterfly plants) below the winding path; more than enough to enable passage. This reduced the remaining nectar for the few butterflies that were left. Within a few minutes the first two of at least three Clouded Yellows were restlessly fluttering around only seen to pause for a second, visiting Wild Basil and Rough Hawkbit. They were followed by a small brownish butterfly and five minutes afterwards at least three female Common Blues were seen visiting three Marjoram plants still flowering at the northern end of the lower slopes. 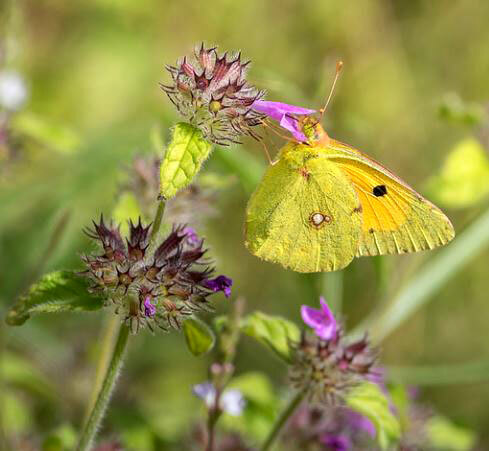 The Marjoram also attracted a Clouded Yellow for two seconds. Common Darters (dragonfly) were frequently seen and outnumbered the total of all the butterflies added together. 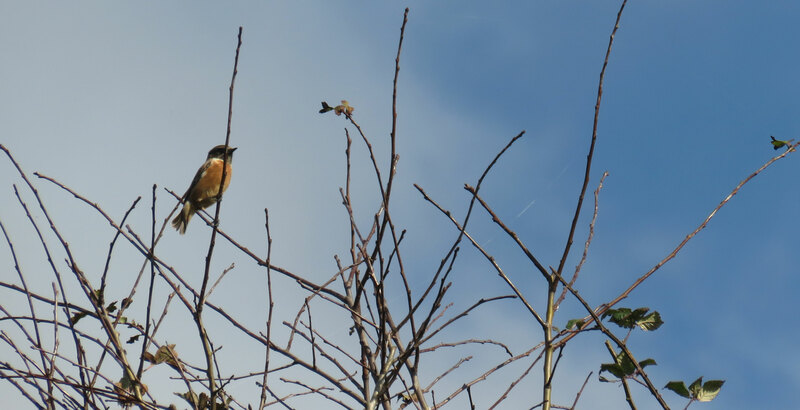 A Stonechat perched on a high bush. Other plants occasionally in flower on the lower slopes included Lesser Hawkbit, Yellow Wort, and Common Centaury. 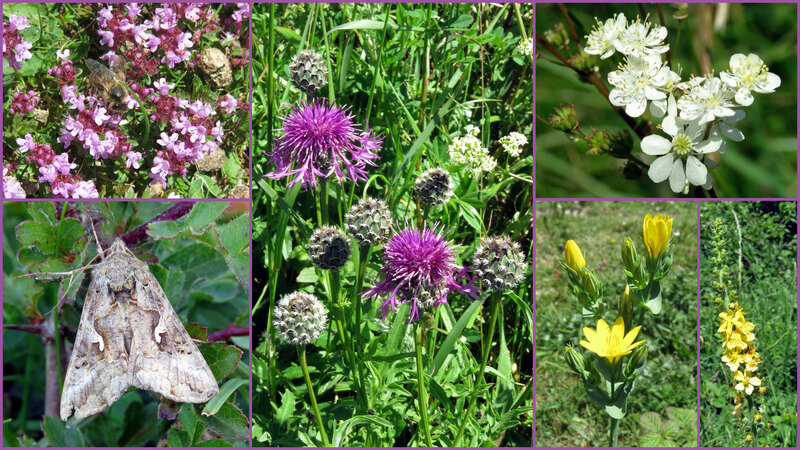 I made a cursory visit to the upper and middle part of the hill where I added a very few Greater Knapweed, Lesser Knapweed, Dwarf Thistle, and Creeping Thistle. After the gales, a brief period of weak sunshine cast long shadows in the late afternoon, and I was pleasantly surprised to see an active Clouded Yellow Butterfly immediately on the upper meadow (north of the top car park) of MiIl Hill. Nectar plants were few and it was restless until it spent a second on the purple flower of one of the few remaining Greater Knapweed. In the rapidly fading light of a misty afternoon, harldy anything moved on the top of Mill Hill. However, I quickly spotted a female Common Blue Butterfly on a Creeping Thistle flower in the upper rough meadow north of the upper car park on Mill Hill. Although the small butterfly remained with its wings closed I was able to catch a tiny glimpse of a chocolate brown upper wing. Colour from wild flowers was sparse and much less than at the start of the month, notably a Round-headed Rampion on the top plateau I had to search for, one Field Scabious and a few Small Scabious, a few tiny Germander Speedwell. There were a bunch of Ink Caps on the middle slopes and a large Dapperling mushroom south of the Reservoir. Already looking for possibly the last butterfly of the year on Mill Hill, a large butterfly flew over me and this was almost certainly a Red Admiral. A few minutes later in the top meadow (north of the upper car park), the same damaged Wall Brown of over a week ago landed briefly in front of me. 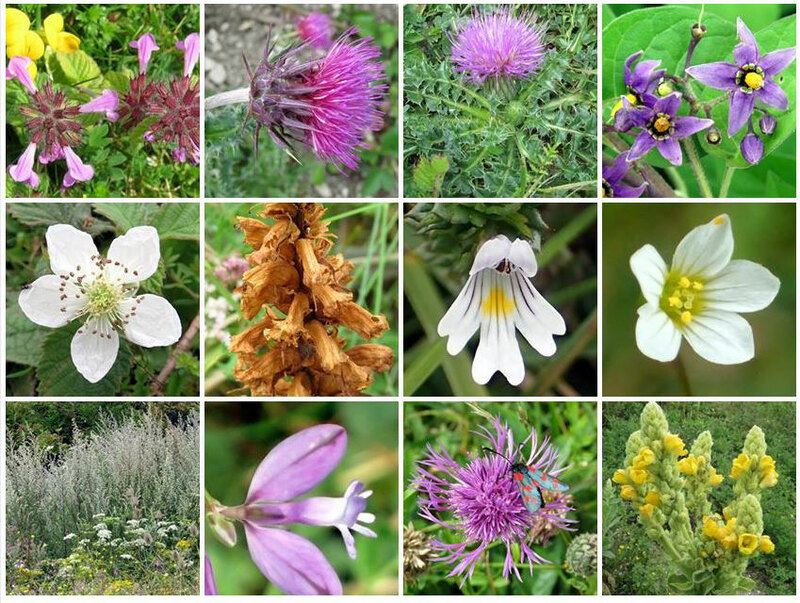 Flowers were scattered but there was at least 27 species of common chalkhill plants on the upper part of the hill around midday. 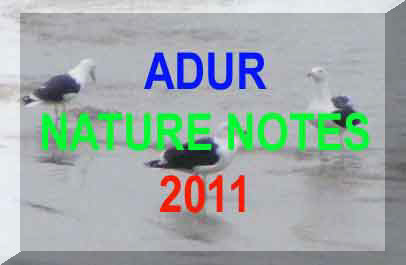 I expect there were at least 30 species as I wasn't diligent in looking for them. I was unhappy about my photographs the previous day, so I cycled up to Mill Hill in the early afternoon. I was lucky with the sun shining from between the Cumulus clouds in a blue sky. 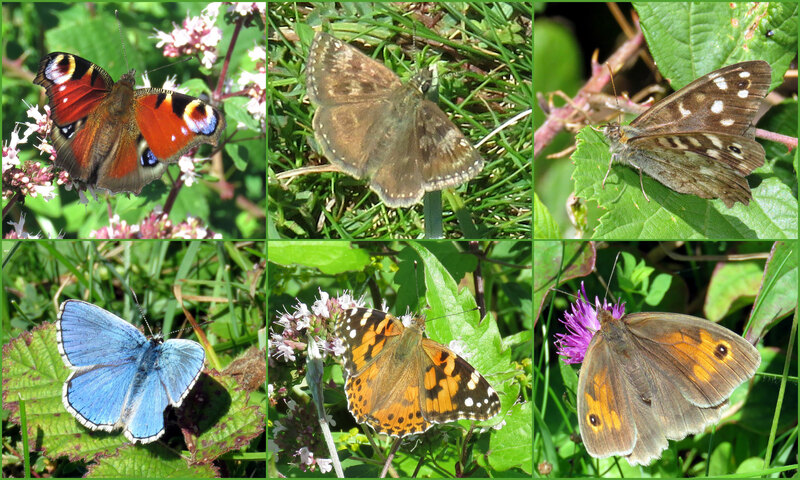 An astonishing seven species of butterfly appeared in seven minutes in the meadow north of the upper car park. Instantly, I spotted a restless Clouded Yellow followed almost simultaneously by a territorial Small Copper chasing off a male Common Blue and the same badly damaged Wall Brown of yesterday. A few Common Darters (dragonfly) patrolled the tarmac path next to the rough meadow. After about three minutes a Large White Butterfly turned up attracted to Creeping Thistle (the favoured nectar flowers) followed immediately by a Small White. 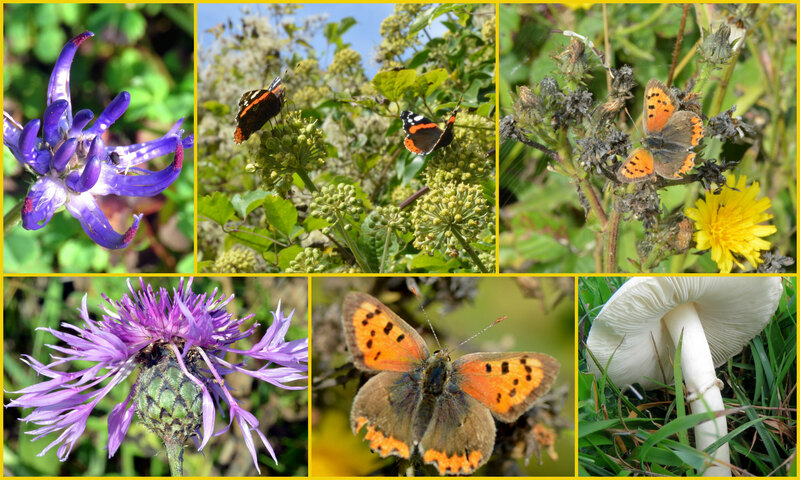 All the species so far had been single until I spotted the seventh butterfly with a pair of Meadow Browns. 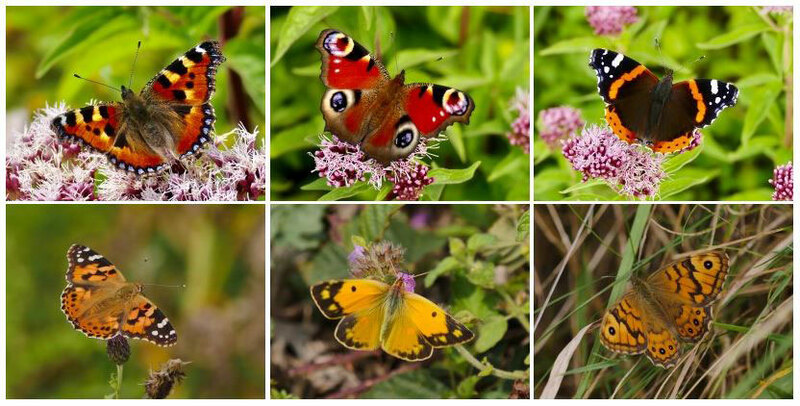 The butterflies squabbled over the available nectar plants with the Small Copper being the main antagonist despite being the smallest butterfly on show. This squabbling compounded the difficulties in photography with already restless butterflies easily disturbed by Common Carder Bees (bumblebee), numerous Crane-flies and other flies, as well as any hint of my long autumn shadow. So I spent some time chasing the butterflies around. Enough time for a majestic Painted Lady to suddenly appear. It did not seem to fly in but was hidden in the meadow and only came to life after the sun had been out for at least twenty minutes. Even the Small Copper deferred to this much larger pristine butterfly to visit the Creeping Thistle (favourite) and Field Scabious (twice, briefly). At least another male Common Blue squabbled with the first one seen and a lesser damaged Wall Brown put in an appearance. 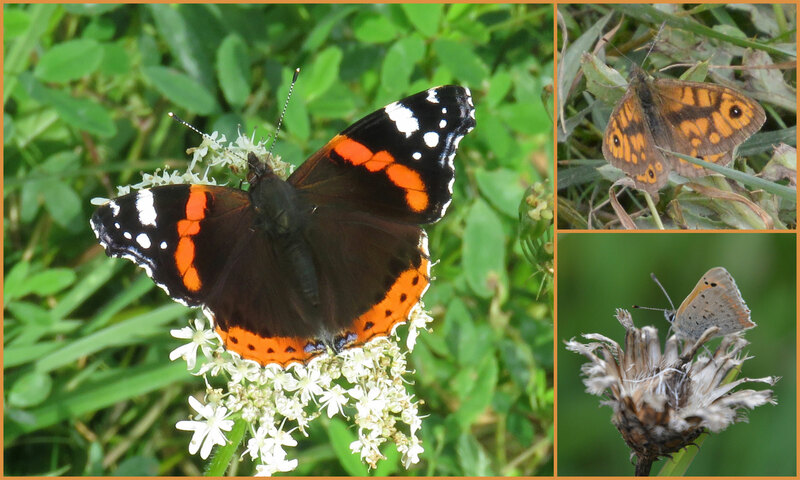 Lastly, a pristine Red Admiral landed immediately in front of me. I took a break to look at the Hemp Agrimony on the middle area where I spotted another Wall Brown and Meadow Brown on passage. 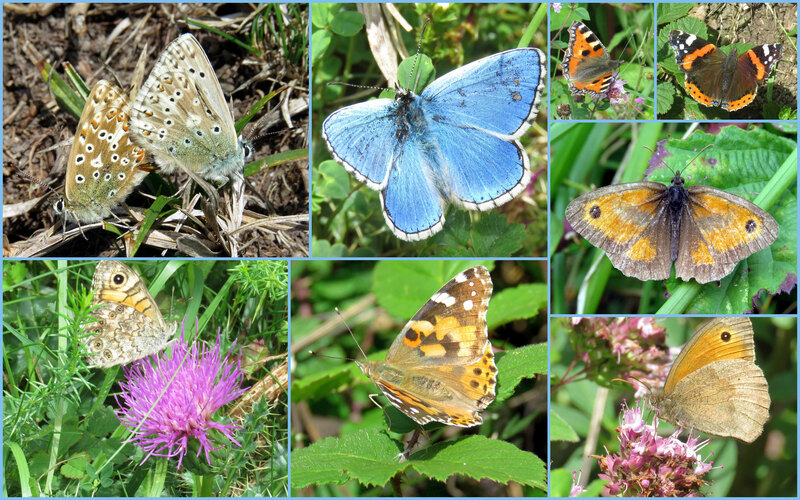 I then went back to the top meadow top find the Meadow Browns copulating, two Wall Browns (including an intact specimen making three at the top meadow), the Painted Lady, Small Copper and the Common Blues were still around. 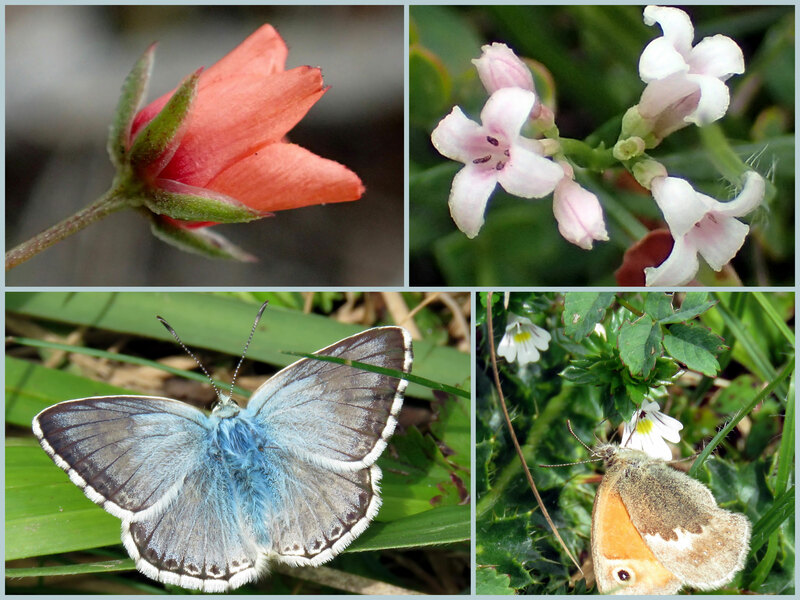 It was too breezy for flower photography and too cool for active butterflies on the top of Mill Hill. However, I did manage to spot a Small Copper Butterfly resting with its wings closed on a Greater Knapweed disc in the meadow north of the upper car park, followed by the first restless Wall Brown. The Wall Brown fluttered north over the rambles and thorn. I detoured off to the middle slopes for a few minutes disturbing a Meadow Brown and spotting another Wall Brown in flight. I returned to the upper meadow where I chanced upon a damaged Wall Brown that was still capable of rigorous rapid flight. This damage identified it as a third separate Wall Brown. And then a fresh Red Admiral landed on a Hogweed immediately in front of me. The hundred plus dark aphids on a Creeping Thistle were Uroleucon cirsii. 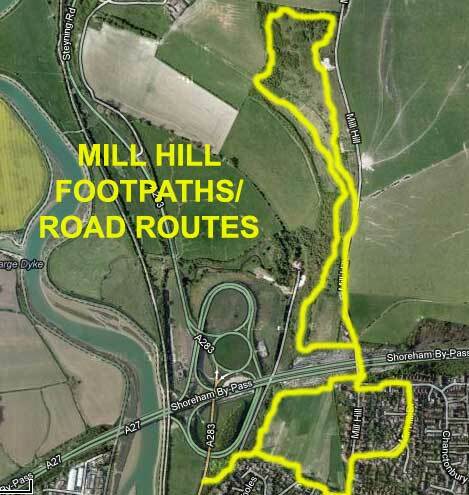 I cycled up to the top of Mill Hill only expecting to feel the bracing breeze under a dark cloudy sky. Too cool for active butterflies, too windy and dark to photograph the few remaining flowers, I nevertheless managed to disturb occasional butterflies in the meadow north of the upper car park .At least two bright Meadow Browns, two male Common Blues, and a Large White were inadvertently dislodged from their resting places. And a damaged Wall Brown was spotted at rest for a few seconds. A clump of overa dozen Ink Cap Mushrooms had appeared by a wooden seat on the middle slopes by the top copse. 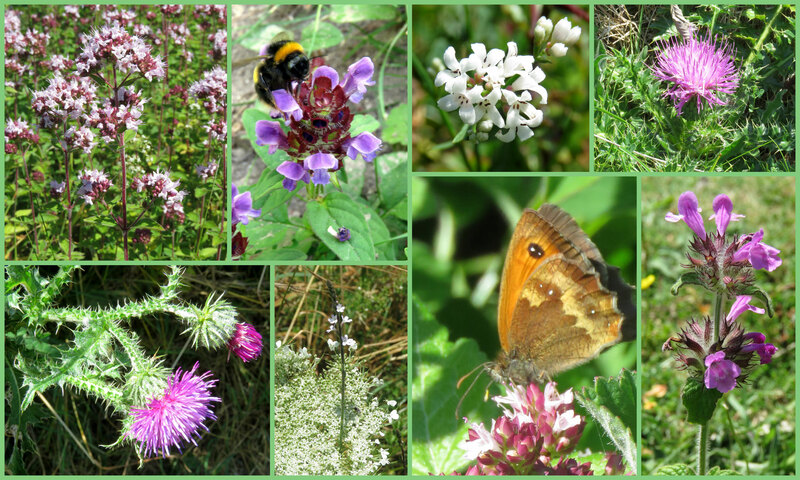 Colour was muted autumn on the upper and middle of Mill Hill, the occasional yellow flowers of Hawkbits and remaining Melilot, occasional remnants of both Knapweeds and Field Scabious, diminutive white flowered umbellifers, and the pink remains of Hemp Agrimony. An afternoon visit to Mill Hill gave me an opportunity to try out my new 105 mm macro lens on the the frequent remaining flowers and observe the frequent butterflies that still fluttered around if disturbed. A Large White was the first butterfly of the day on a Buddleia at the bottom of Mill Hill Road (north Shoreham). Red Admirals werecounted at nine, with four each on two different Ivy bushes. Meadow Browns were frequently seen but not as many as two days ago, but this could have been because it was a cooler. Four Wall Browns chased each other and chased a Small Copper off a Common Ragwort. I only visited the northern part of the lower slopes where a Clouded Yellow and a Large White fluttered by and a few Treble-bar Moths rose when I nearly trod on them. .Common Blue Butterflies of both genders were frequently seen but were a bit flighty. Occasional Common Darters (dragonfly) appeared on over the lower and middle slopes and over the paths through the scrub. Only seven species of butterfly this time out. Two more large white-gilled Dapperling mushrooms were spotted and both of these had stem rings. I was surprised to spot as few isolated Bulbous Buttercup flowers on the upper to middle slopes. A few Swallows flew at low level and a Kestrel glided in the sky, initially facing in the west wind.. A chirm of Goldfinches flew into the thorn. And two Magpies squabbled. A rather hazy extremely humid afternoon on Mill Hill was worth quite a long visit of two hours (more time taken as I am no longer so fast on my feet). 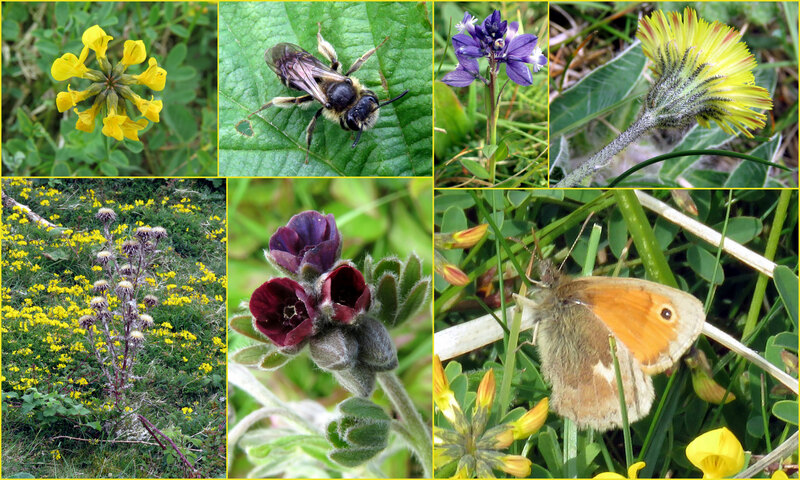 Wild flowers were scattered around with too many species to list, notably the isolated spikes of Round-headed Rampion on the top plateau, the yellow rosettes of Rough Hawkbit, and a few remaining Greater Knapweed that was attractive to both bees and butterflies. 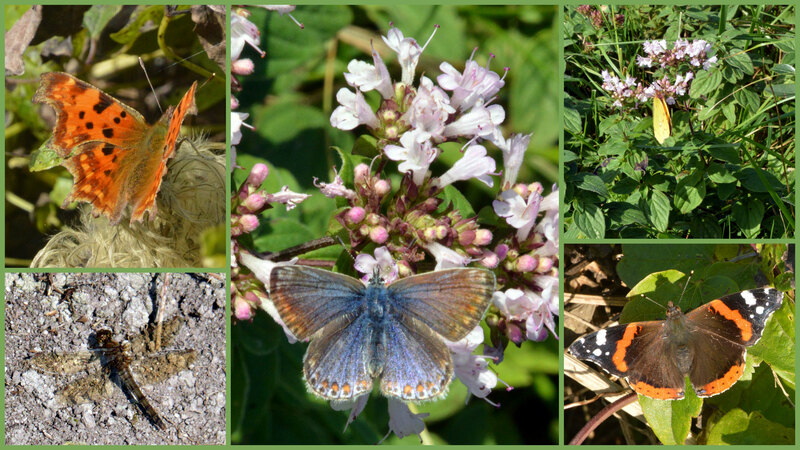 A Large White was the first butterfly of the day followed by a Red Admiral on Mill Hill Road north of the bridge. Meadow Browns were frequently seen collecting nectar. 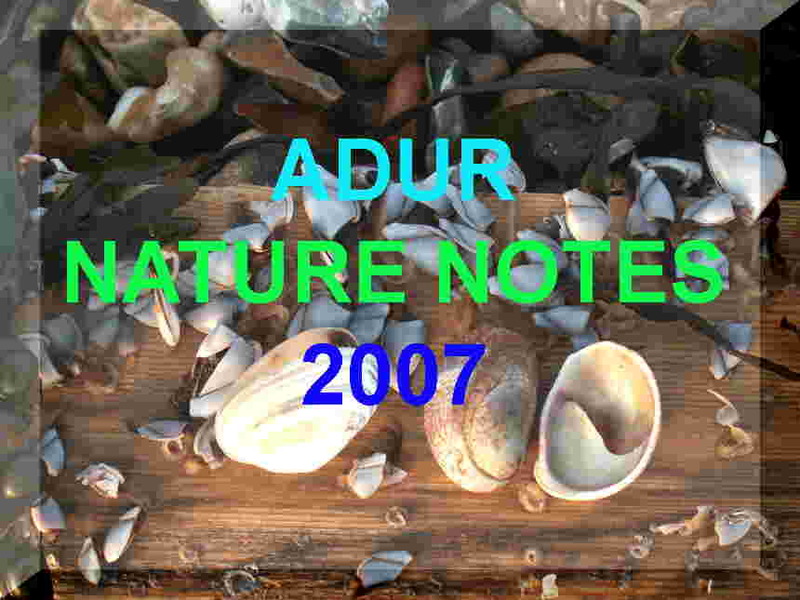 They varied from tatty to a bit worn and none were fresh specimens, and all needed to be disturbed. I trekked over the top plateau of short turf directly the "the Patch" region of the middle slopes down the steps to the lower slopes. Devil's Coach-horse Beetles, Staphylinus olens, and craneflies were seen frequently, It was on the middle slopes that a Peacock Butterfly fluttered rapidly overhead as I headed for the Hemp Agrimony that was devoid of butterflies. A Speckled Wood Butterfly patrolled the steps in amongst the scrub. The Ivy (next to the gate to the Erringham pasture) was attractive to two Red Admirals and score or more of bees and wasps and hoverflies. I only visited the small northern section of the lower slopes where the Devil's Bit Scabious was in flower and attracting two Meadow Browns. 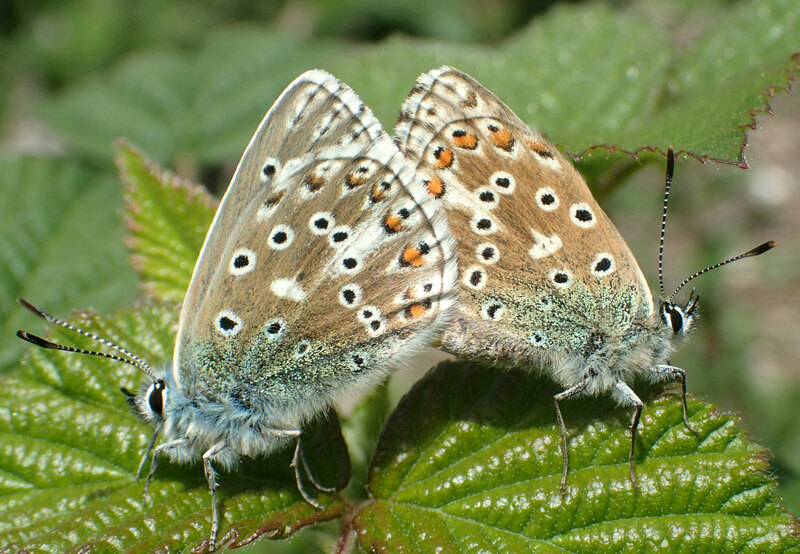 A pair of Common Blue Butterflies were seen mating (the first time I've caught the in copulation since 2014) and there were more than handful of both genders. I only stayed long enough to add two restless Clouded Yellows, three Large Whites, and best of all a Small Copper which flew away a few seconds after my eyes clocked it. I scrambled my return via the middle slopes with a succession of one Meadow Brown after another until I finally got a fleeting glance of a fresh Wall Brown. On the middle slopes I spotted a flowering Autumn Gentian amongst the almost finished Marjoram, whereas the top plateau all that remained were the brown clumps. Occasional Common Darters (dragonfly) appeared on over the lower and middle slopes and over the paths through the scrub. Of the cichorioid daisies (dandelion-types) that are so easy to confuse, the lower slopes of Mill Hill hosted Rough Hawkbit and Lesser Hawkbit, but not Smooth Hawk's-beard (misidentified). 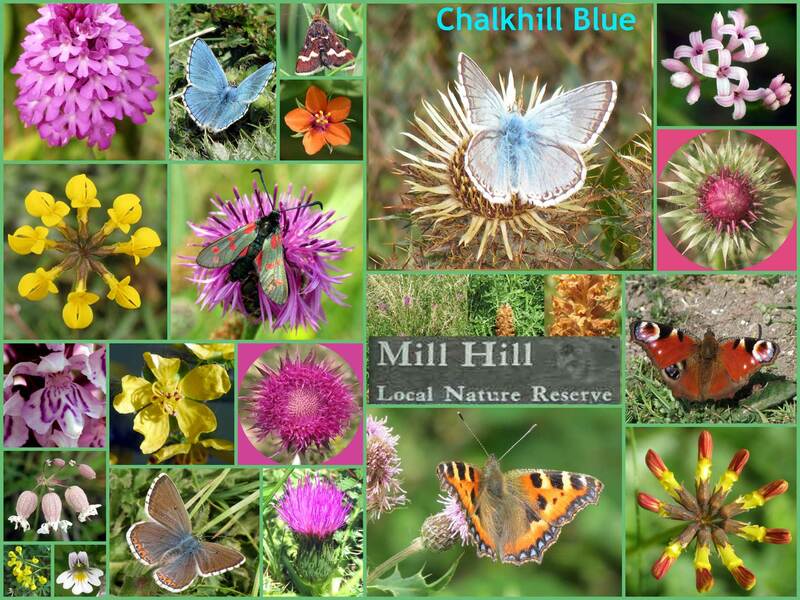 This week's Mill Hill transect and I was grateful for the blue sky: Adonis Blue 7, Clouded Yellow 4, Common Blue, Meadow Brown 11, Peacock, Red Admiral, Small Copper 4, Small Heath 3, Small White 4, Wall Brown. 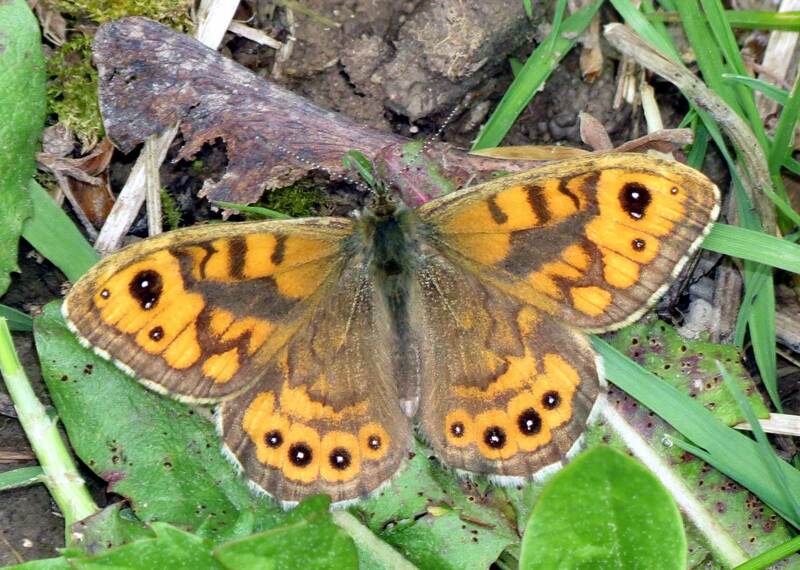 I saw four more Wall Brown after the transect was completed, but they were very skittish. A flying visit to Mill Hill produced 3 very fresh female Wall Brown within minutes of the brightening sky mid afternoon at the northern end of the middle path. Unfortunately no males were seen. I spent a fabulous couple of hours at Mill Hill, and enjoyed the company of Dave Cook. 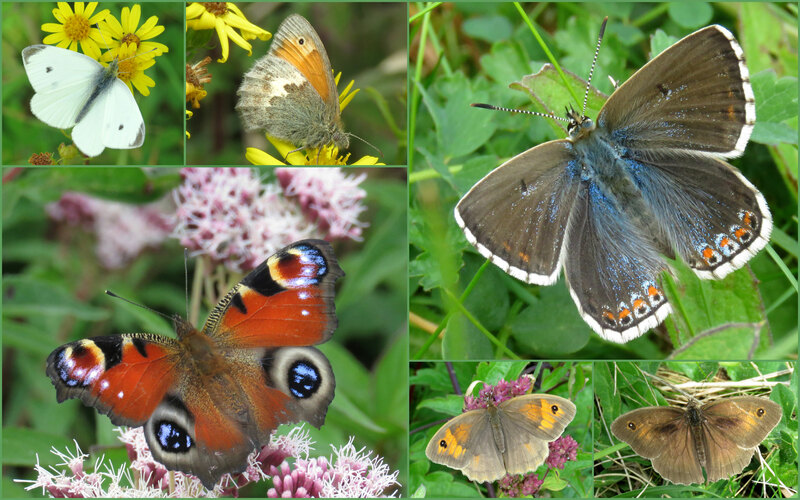 Among the fresh butterflies seen were several Common Blues, Small Coppers, Brown Argus, four out of five Clouded Yellows, many Peacocks and a few third brood Wall Browns. 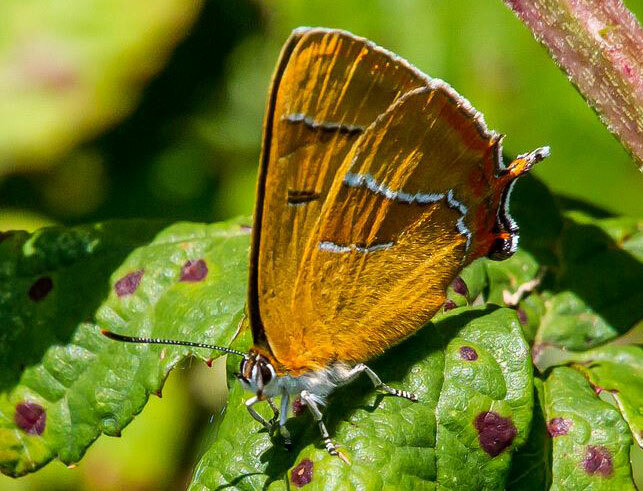 A total surprise was a female Brown Hairstreak. With an hour to kill and the sun in the sky, I headed to Mill Hill in the morning. There were still a few butterflies. 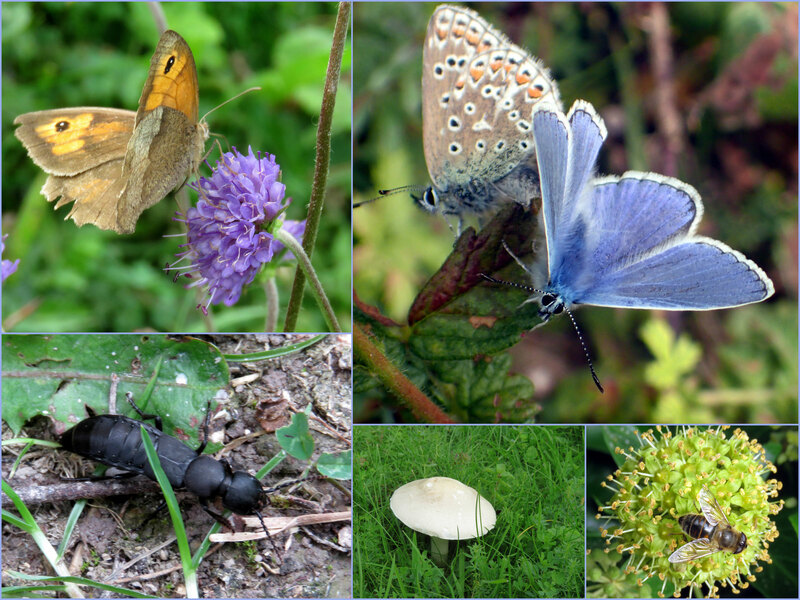 Peacock, Common Blue, Adonis Blue (female), Small Heath, Meadow Brown, Small Copper and a Clouded Yellow. Swallows swooped low over the upper plateau of Mill Hill with changeable weather prior to migration. Their forked tails were clear on a mainly cloudy day. 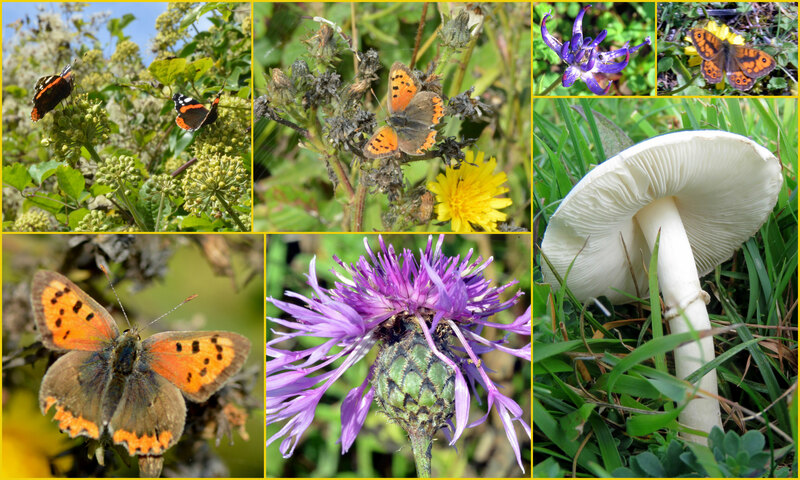 When the sun shone through the gaps in the clouds a few butterflies made some brief flights in search of nectar notably a Clouded Yellow flitting from Hawkbit to Ragwort for a second on each. Three Small Heath Butterflies were seen. On the rough meadow at the top, occasional Meadow Browns were disturbed. 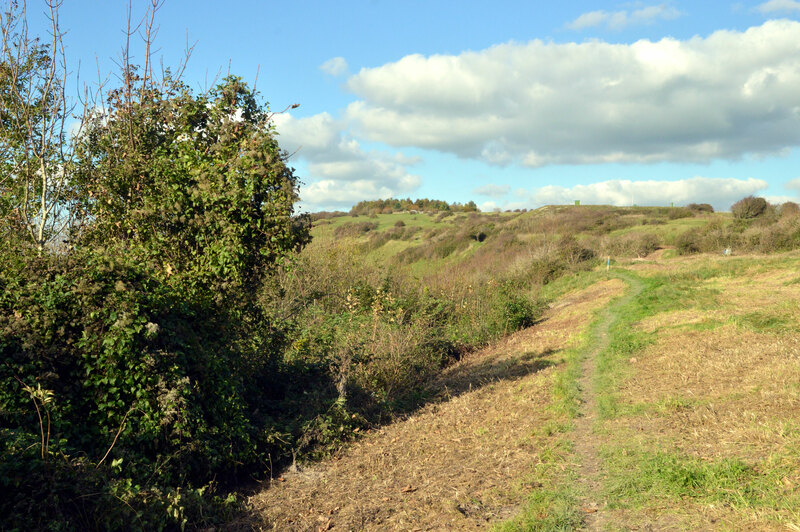 There was a Small White Butterfly around the Blackthorn on the edge of the top copse by the tarmac path. The Blackthorn was losing its leaves. On the middle slopes two male fresh Common Blues fluttered about, rarely settling. No butterflies were seen on Hemp Agrimony in the early afternoon. 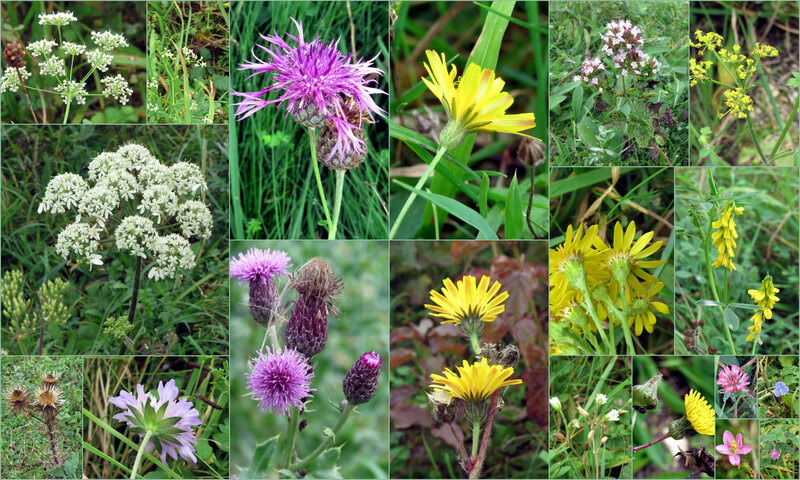 There was still a little bit of flowering colour on the top meadows and twenty or so wild plants were still showing amongst the thousands of seed heads. The white fluffy seeds of Creeping Thistle were noticeable blown about in the slight breeze. Round-headed Rampion could be searched out on the plateau. Quite a few fresh Peacock, Small Tortoiseshell, Red Admiral, around the Hemp Agrimony on the upper north side of Mill Hill. And on the lower slope three male Clouded Yellow plus one very fresh looking female amongst lots of Small Heath and now tired Adonis Blue. On the way back to the car I found one very fresh female Wall Brown in the grass and a very amiable Painted Lady. Blustery with rain in the air, a cloudy afternoon was unfavourable for butterflies to be out and they weren't. Well, not many on the upper part of Mill Hill, just seven Small Heaths and seven Meadow Browns, one Large White, one Small White and the tiny pyralid micro-moth Pyrausta despicata on the area immediately north of the Reservoir. A flight of a dozen or so Swallows flew low over the top plateau prior to migration. A chirm of seven Goldfinches was an attractive sight as they settled on the bushes south of the Reservoir. In the rough meadow north of the upper care park, I disturbed another dozen Meadow Browns in a minute and another twenty on the middle slopes in three minutes. The large patches of Hemp Agrimony did not host any butterflies, but a Peacock Butterfly rose from the path in front of me. 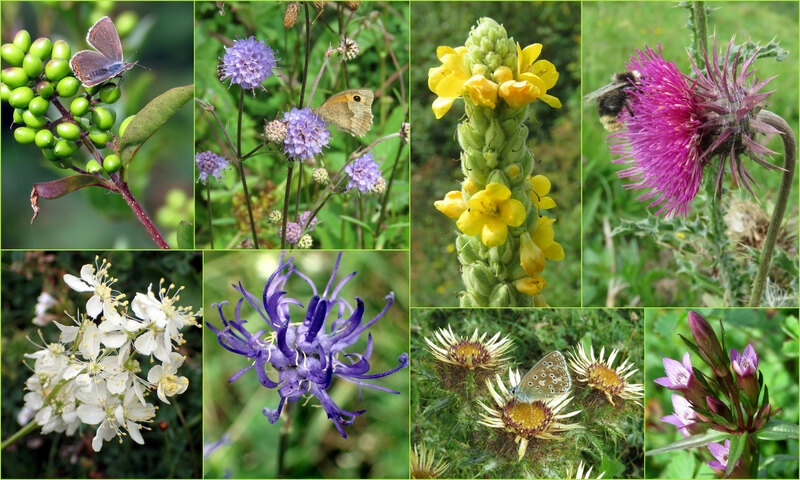 Although the weather was autumny there were still too many flowers to list. The Common Carder Bee (bumblebee) could be seen visiting flowerheads, mostly the few remaining Greater Knapweed and Field Scabious. I spotted a gap in the bad weather at noon and headed to Mill Hill: Adonis Blue 20, Brown Argus 2, Clouded Yellow, Meadow Brown 31, Red Admiral, Small Heath 18, Small White 2, Mother of Pearl moth (Pleuroptya ruralis). I made a brief sortie to the upper part of Mill Hill as the weather was pleasant and the white fluffy Cumulus clouds on the blue sky made conditions conducive to photography in the middle of the day. There was a Common Lizard and a few plump Slow Worms south of the Reservoir. Butterflieswere very frequently flying around and I chose the area immediately north of the Reservoir to record the species which were frequent MeadowBrowns (20+) and frequent Small Heaths (15+), seen continuously as were the males of the occasional Adonis Blues (8+), more conspicuous than frequent with at least two chocolate brown females in fine condition. 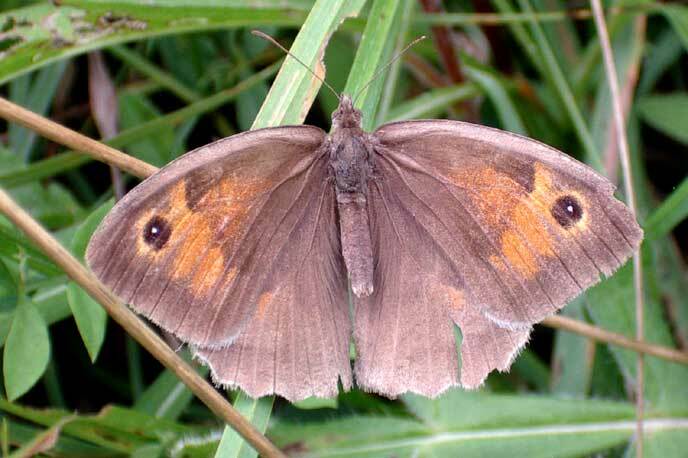 A tatty brown female looked like a Chalkhill Blue. On the middle slopes, Hemp Agrimony was an attractant for at least three Peacock Butterflies, two Red Admirals, a male Common Blue and occasional Meadow Browns. 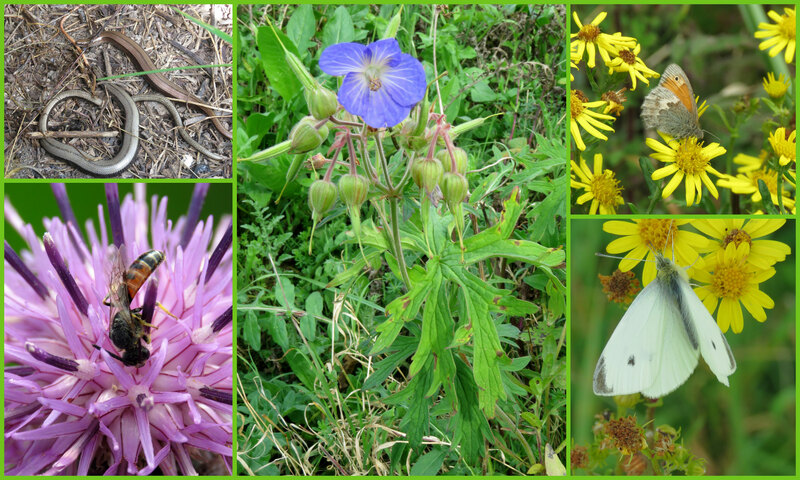 Common Ragwort and other flowers were visited by a big Large White and a handful of Small Whites. 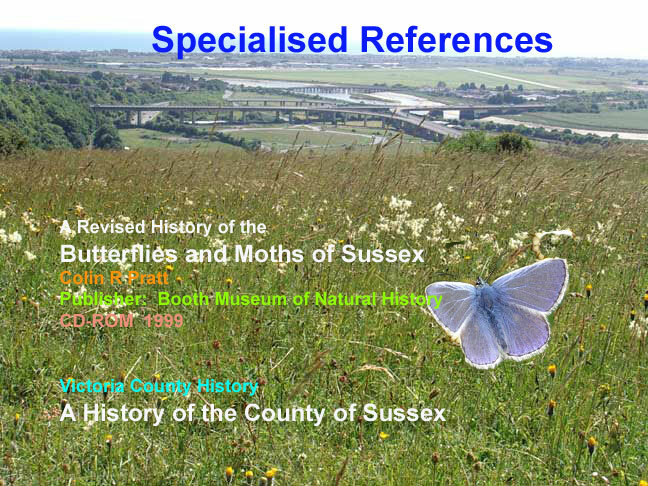 With the marked difference between the flora on the top of Mill Hill and the Rifle Range, Steyning Downs visited yesterday, came a difference in the butterflies seen. I only made a passage visit to the small area north of the Reservoir on Mill Hill where the frequent Meadow Browns were the same but not five Chalkhill Blues including an amorous pair, half a dozen or so male Adonis Blues, occasional Small Heaths (9+) and a one second glance of a Silver-spotted Skipper visiting a low level Lesser Knapweed. 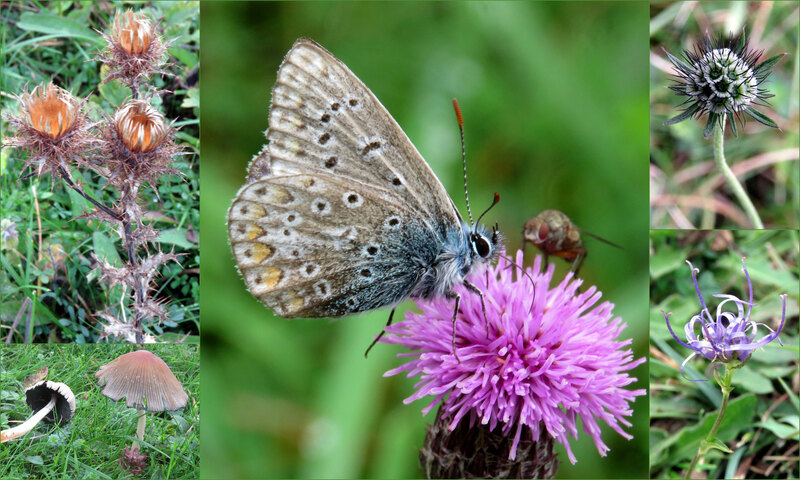 One Chalkhill Blue made a fleeting visit to a Round-headed Rampion. The micro moths were probably the Common Grass-veneer Agriphila tristella. They were prevalent but I have no idea how many there were. 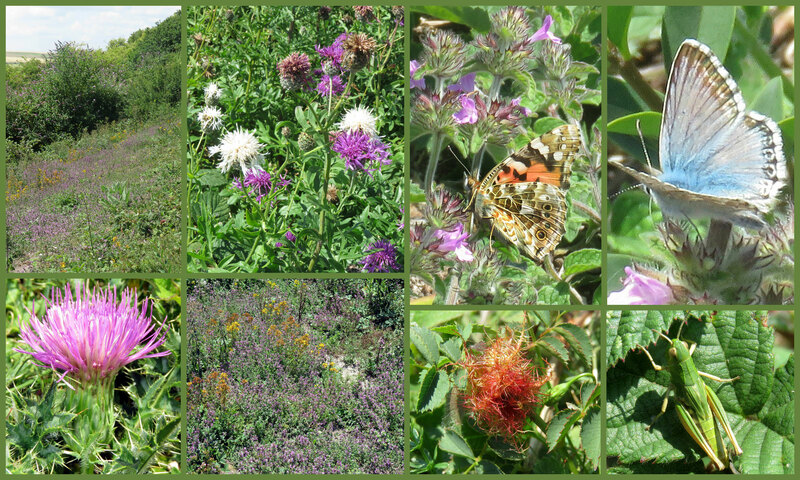 On a cloudy day, I made late morning visit to Mill Hill before the intermittent weak sun had woken up the butterflies. I still managed to disturb several hundred. The tally for the half transect (the Privet prevented the whole acre transect) on the lower slopes was an unprecedented 153 Adonis Blues (including 17 females), 11 Chalkhill Blues (including one female), a few Common Blues (including one female), an estimated 75+ Meadow Browns, an estimated 30+ Small Heaths, a few each of Green-veined Whites, Small Whites and Large Whites, at least four restless Clouded Yellows, a Treble-bar Moth, a Blood-Vein Moth and frequent faded pyralid moths Pyrausta purpuralis. A few of the Meadow Browns visited the Devil's Bit Scabious now in flower at the northern end of the lower slopes. 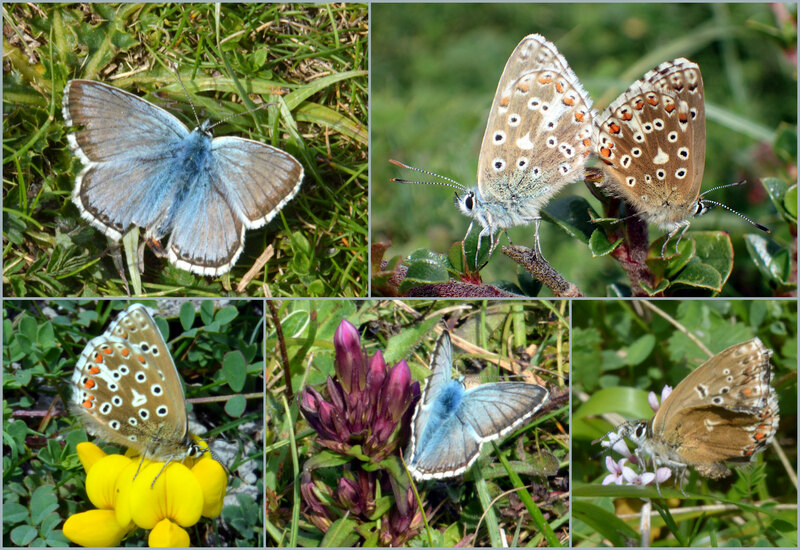 Some of the Meadow Browns looked fresh, but none of the Adonis Blues did and one in ten was frayed at the edges. Perennial Sow Thistle was recorded at the northern end of the lower slopes for the first time. 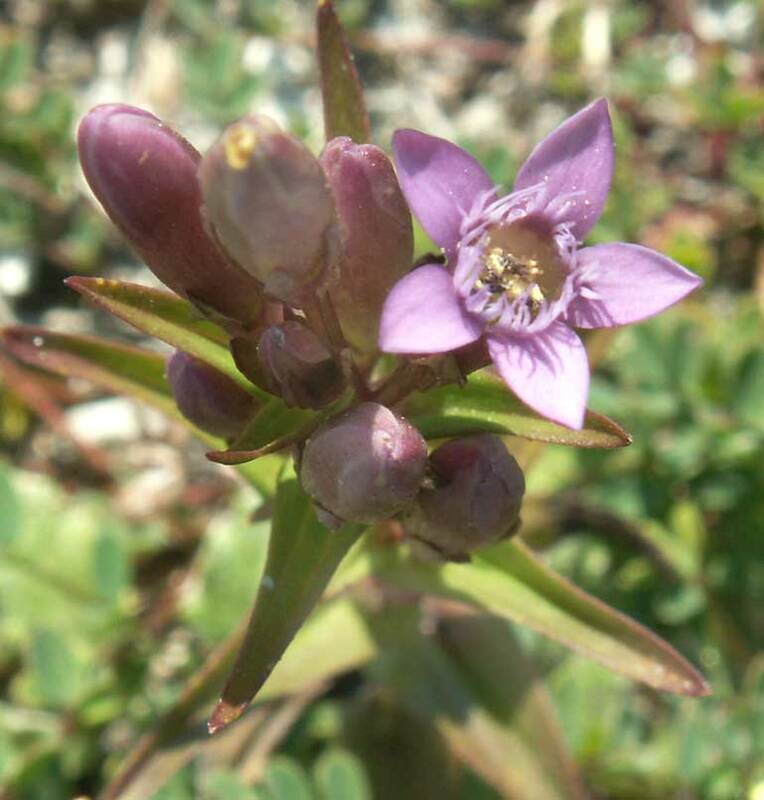 On the plateau north of the Reservoir, Autumn Gentian was now beginning its short flowering period. It was where the vegetation had grown where the top plateau abuts the Reservoir compound that I counted nine more male Adonis Blues, one Chalkhill Blue and over a dozen Meadow Browns. 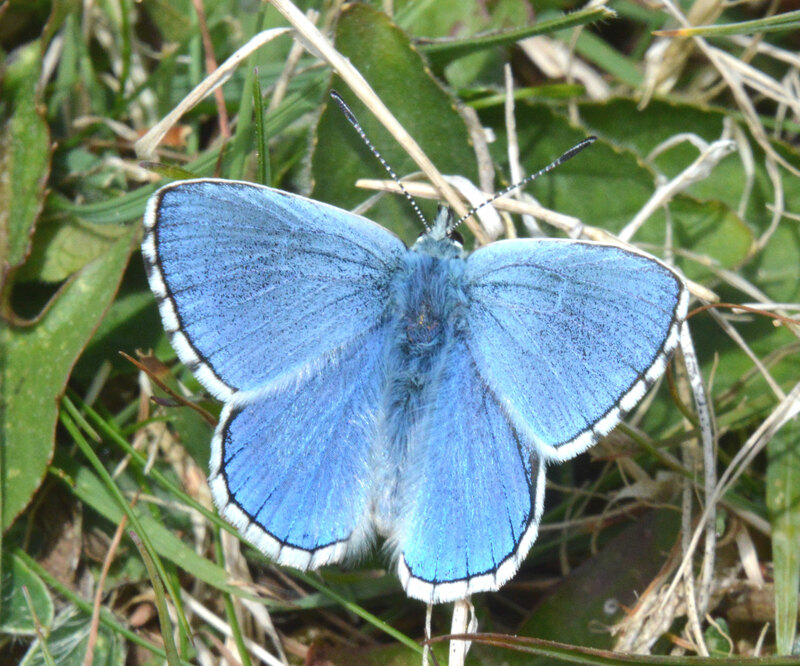 On the middle slopes there were eight more Adonis Blues and a Chalkhill Blue, another twenty or so Meadow Browns, the same number of Small Heaths and a few Common Blues. One particularly large Green-veined White visited of of the few remaining Marjoram in flower. As I rested on the seat, a yellow Brimstone Butterfly flew past. The tiny micro-moth Pyrausta despicata was also spotted. Fatigue set in and I only made a less than cursory visit to the meadow north of the upper car park as I expected just more of the same. I did chance upon a faded Painted Lady visiting a Greater Knapweed in flower. Musk Thistle was flowering on the ridge. Common Toadflax was flowering on the top of Mill Hill in several places. 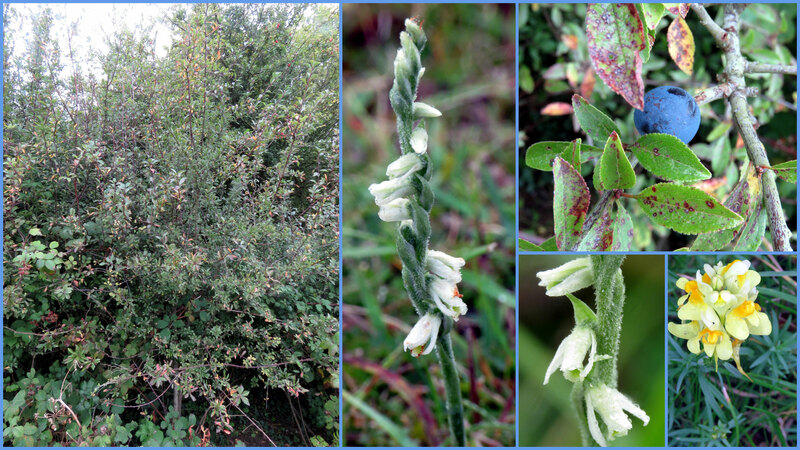 A few spikes of Autumn Lady's Tresses (an orchid) had just appeared on the top plateau of Mill Hill, just north of the Reservoir, on a grey overcast afternoon. They were small and difficult to spot. 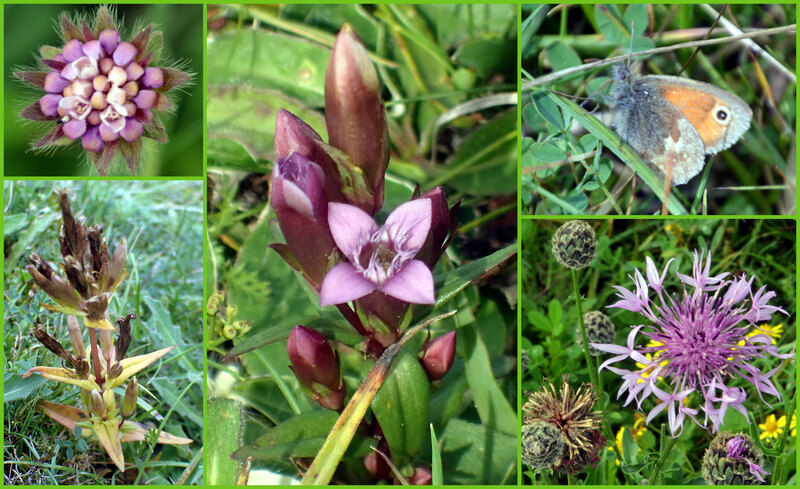 I looked over hundreds of Autumn Gentian but although budding none of them showed in flower. The knapweeds had mostly ceased flowering and the top of the hill showed Common Ragwort yellow as the most prevalent colour. A single Common Toadflax was seen on the east verge of the country road. Although the conditions were inimical for butterflies, I disturbed frequent Meadow Browns (12+), occasional Small Heaths and occasional tiny pyralid moths Pyrausta despicata, as well as one each of a male Adonis Blue and Common Blue on the top of the hill (the only area visited). 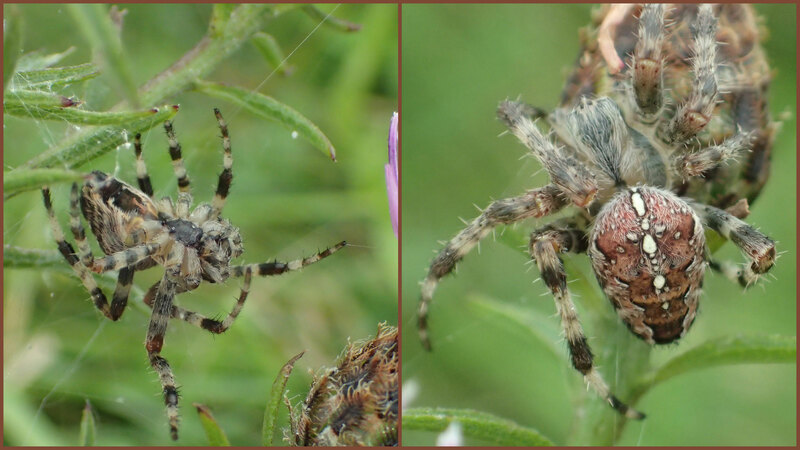 Garden Orb Spider, Araneus diadematus, the first record from Mill Hill, where it was discovered on a Hardhead south of the Reservoir. After the early morning rain it was gusting to Gale Force 8 and on the top of Mill Hill, it felt constant from due west nearly blowing me off my feet. For the record on the meadow north of the top car park, there were frequent male Common Blues (30+), frequent Meadow Browns (25+), a few Small Whites, two Wall Browns, occasional male Adonis Blues (5+) and a handful of Small Heaths. The windswept middle slopes showed the Hemp Agrimony growing up and in flower, but hosting only the occasional butterflies, mostly Meadow Browns, but also my first Common Darter (dragonfly) of the year. The small area north of the Reservoir as rather exposed on the plateau area where I spotted more Small Heaths and the only male Chalkhill Blue on passage, and disturbed more than a dozen Meadow Browns amongst the taller and thicker vegetation in a minute. 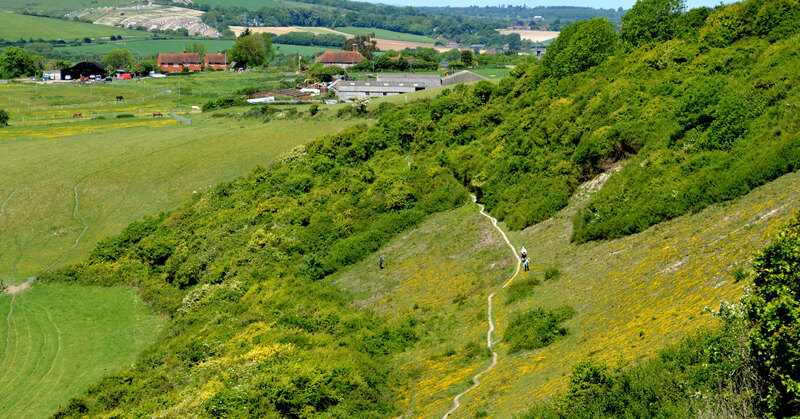 As I was not happy with the pictures yesterday, I returned to the top of Mill Hill but the southerly breeze was much too strong (Force 6) for photography. There were still plenty of MeadowBrowns with more than fifty in ten minutes, and occasional pristine male Chalkhill Blues and good condition male Adonis Blues, a few poor condition Common Blues and a few Small Heaths and big Large Whites all in the small area north of the Reservoir. 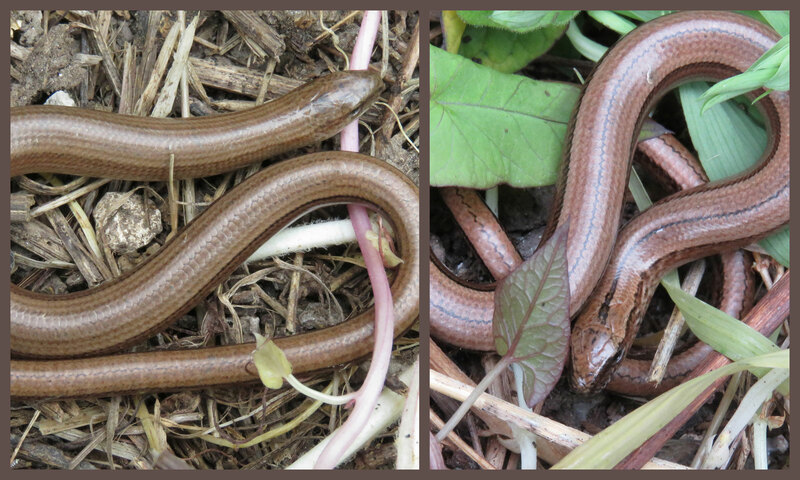 There were three large Slow Worms as well. After two weeks off because of rain, breezes and other inclement weather, I cycled up to Mill Hill in warm humid conditions in the afternoon. Butterflies were common enough but not very varied. I parked my ebike just north of the Reservoir and I was immediately struck by butterflies quarrelling in the breeze. A male Adonis Blue chased a good condition male Chalkhill Blue where the plateau merged into the longer vegetation above the ridge with a few Meadow Browns. It was good sign and I counted nine Chalkhill Blues in a minute. 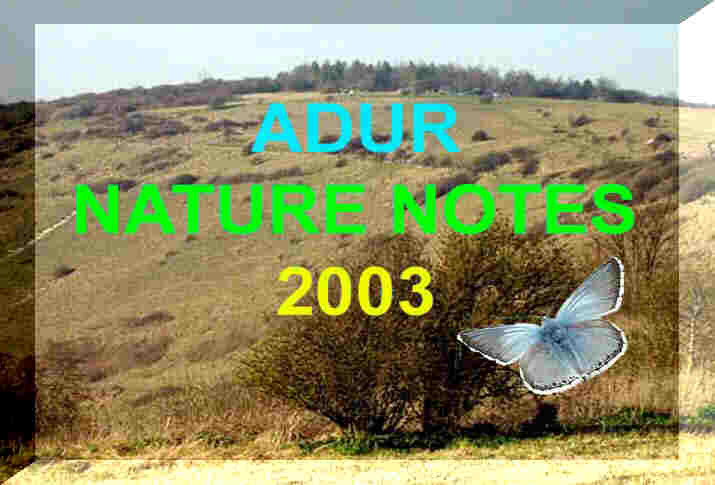 On the middle slopes and upper meadows there were very frequent Meadow Browns, frequent Adonis Blues, Chalkhill Blues, Common Blues and Small Heaths. The Hemp Agrimony hosted one Small Tortoiseshell and a Red Admiral. 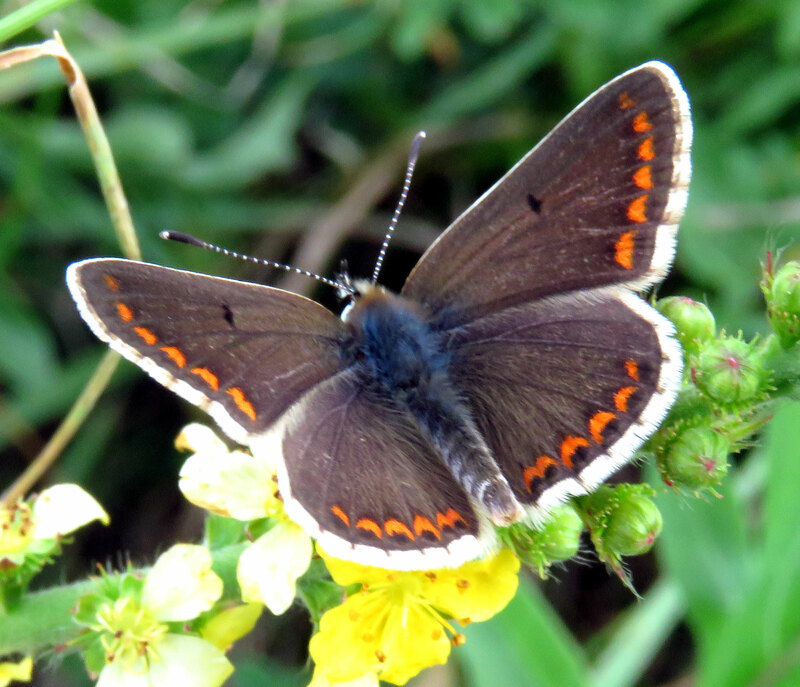 The short turf of the upper plateau added a Brown Argus. I packed my camera away to unlock my bike to go home. 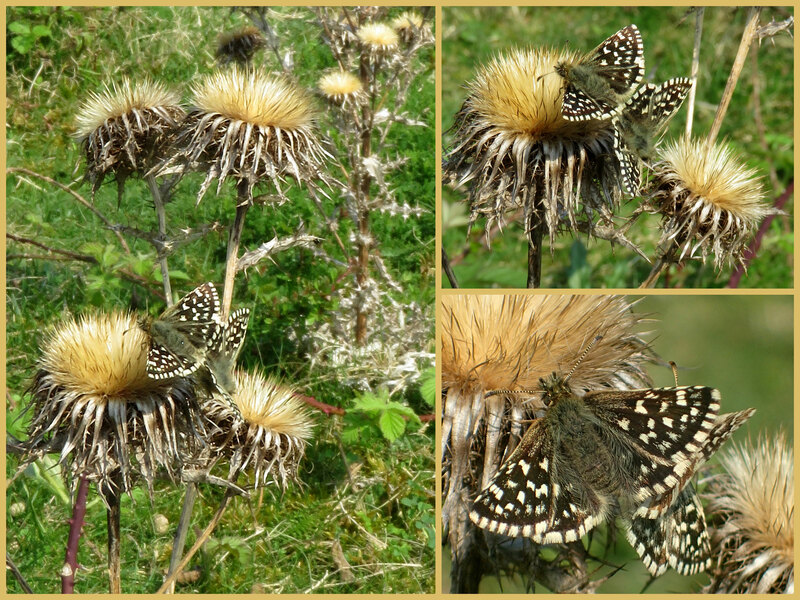 It was then I spotted my first Silver Spotted Skipper of the year visiting a Dwarf Thistle right next to my ebike! 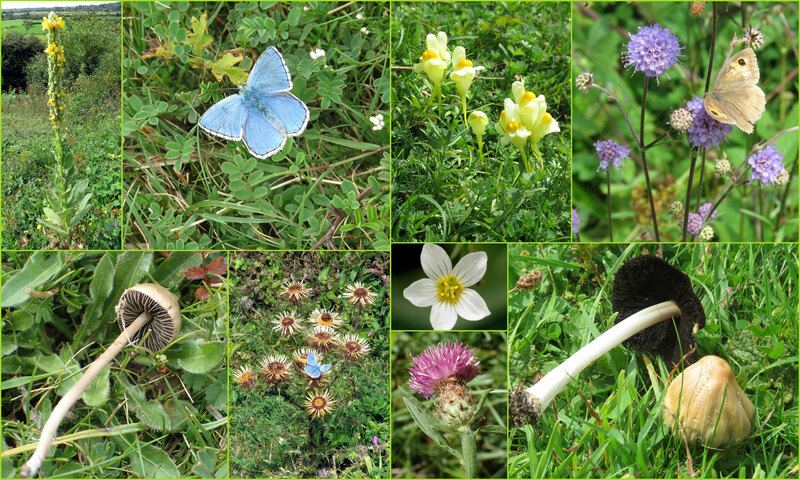 On the plateau Round-headed Rampion was in flower and hundreds of Autumn Gentian were budding. There was still time for a pyralid moth Pyrausta despicata to make an appearance. I did not spot a single Gatekeeper for sure. 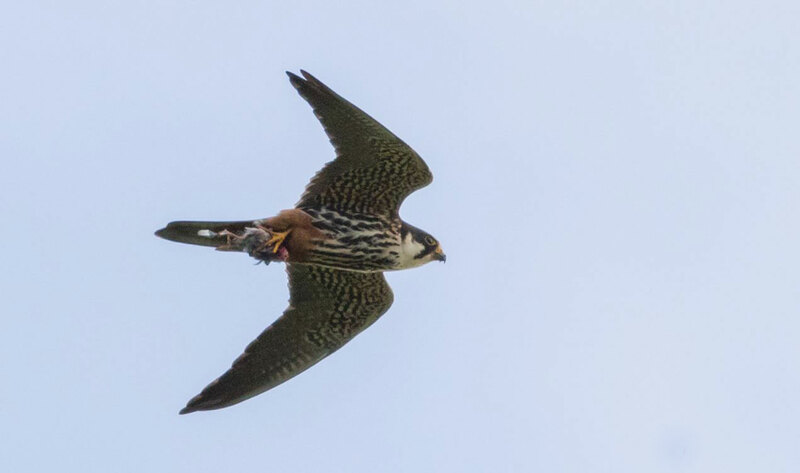 The Hobby flew overhead briefly in the strong breeze and headed off north-west with a Wren in its talons. As far as I am aware this is the first positive record of a Brown Hairstreak from any part of Mill Hill. 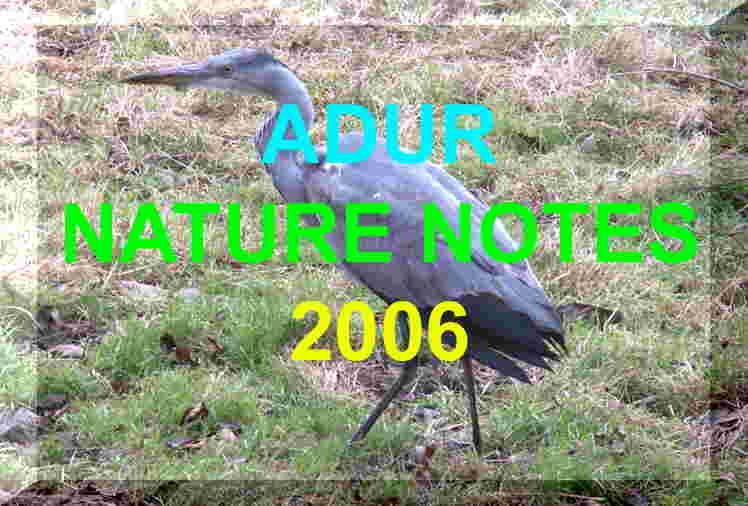 This one was discovered by Etienne Fournier near the copse and north of the top car park. It occurred where there was Blackthorn and sloe berries in the tall hedgerow. 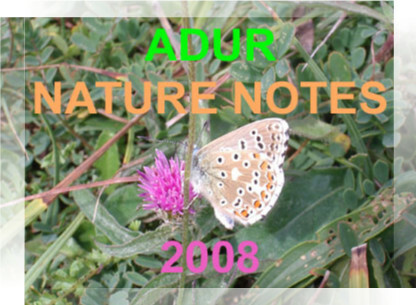 NB: An unconfirmed fleeting view of this elusive butterfly has been seen by myself on Mill Hill as well as one personally photographed record in north Shoreham in 2010. 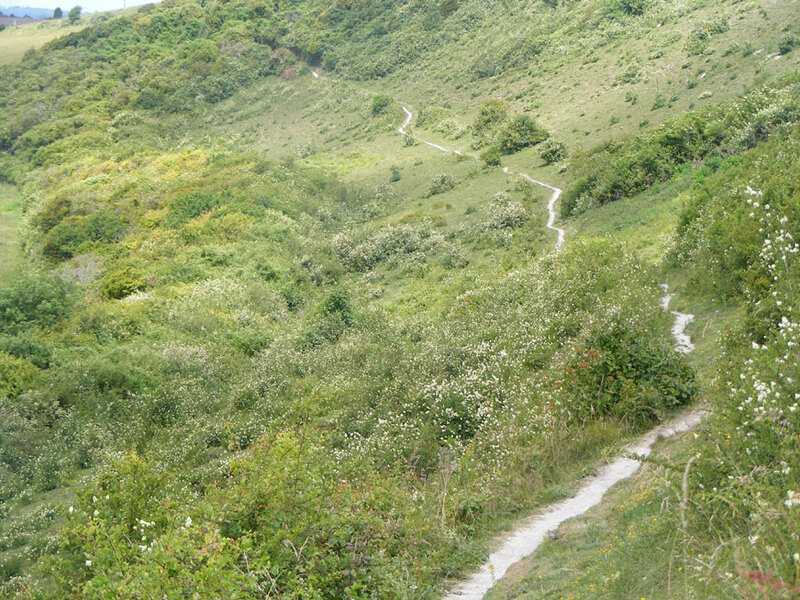 I returned by the ridge route and over the middle slopes, adding four Red Admirals on Buddleia, five Peacock Butterflies, a Small Tortoiseshell and a Painted Lady on Marjoram. 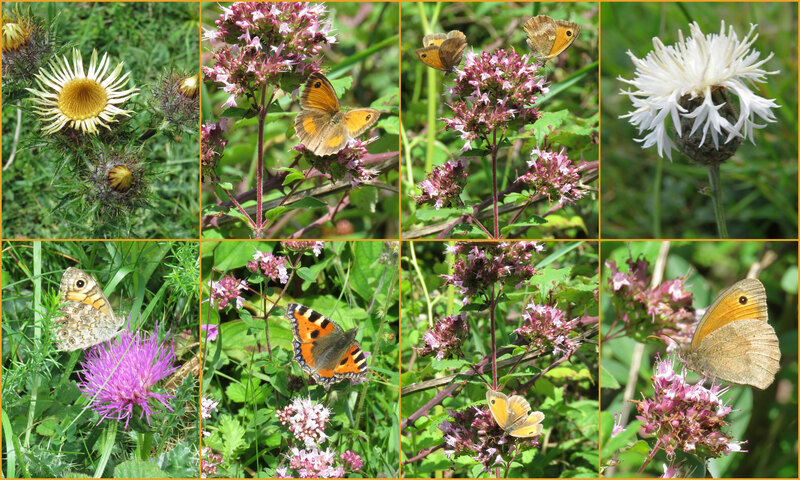 The Marjoram patches on the middle slopes of Mill Hill were also attractive to more Meadow Browns (20+) and Gatekeepers (20+), one good condition Wall Brown, another big yellow Brimstone Butterfly, unidentified Whites^, two more Clouded Yellows, and a score or more Common Blues that stopped for only a seconds. 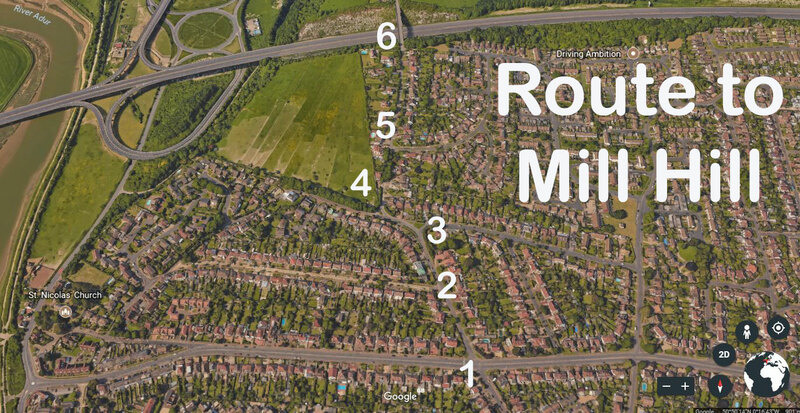 The top meadows on Mill Hill were only transversed on passage and given only a cursory view. 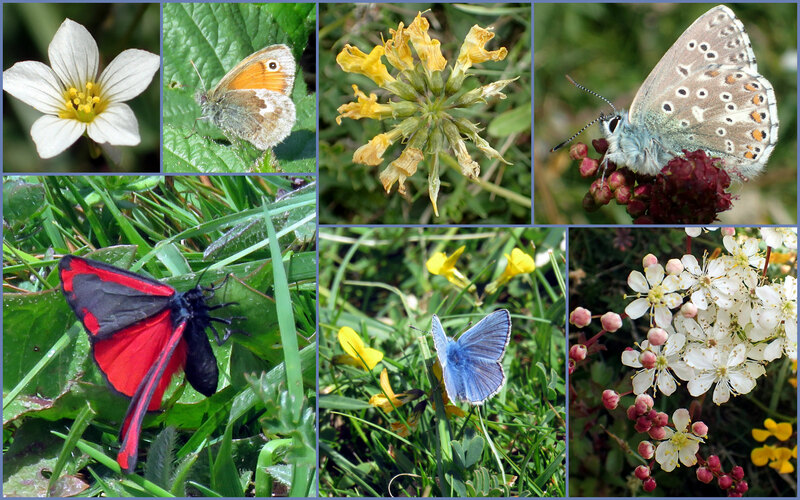 I quickly disturbed a dozen or more Common Blues, more Meadow Browns and Gatekeepers, and one pristine Brown Argus. A few pairs of Small Heaths were present over the top plateau. There were five male Chalkhill Blues immediately north of the Reservoir. A large cloud blocked out the sun and sent a large shadow over the lower slopes of Mill Hill. This tends to send the butterflies into hiding and then they were only seen if actively disturbed. This gives disappointing numbers of butterflies at the peak time for numbers in the whole of the year. I battled though the Privet on the lower slopes and I only recorded 53 male Chalkhill Blues plus one mating female on a 90% coverage of my transect acre. I was surprised to record my first eleven second brood male Adonis Blues. 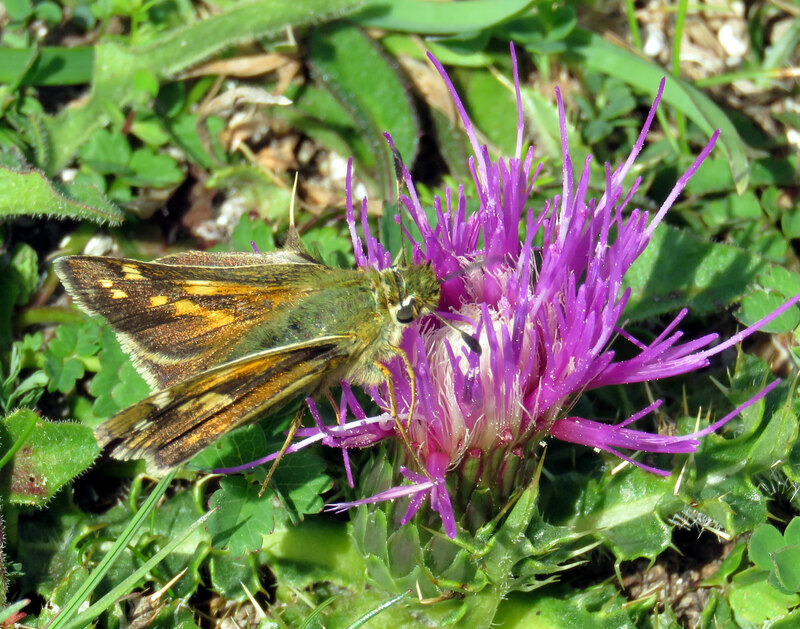 A Wall Brown visited a Dwarf Thistle. Small Heath Butterflies courted in the breeze. 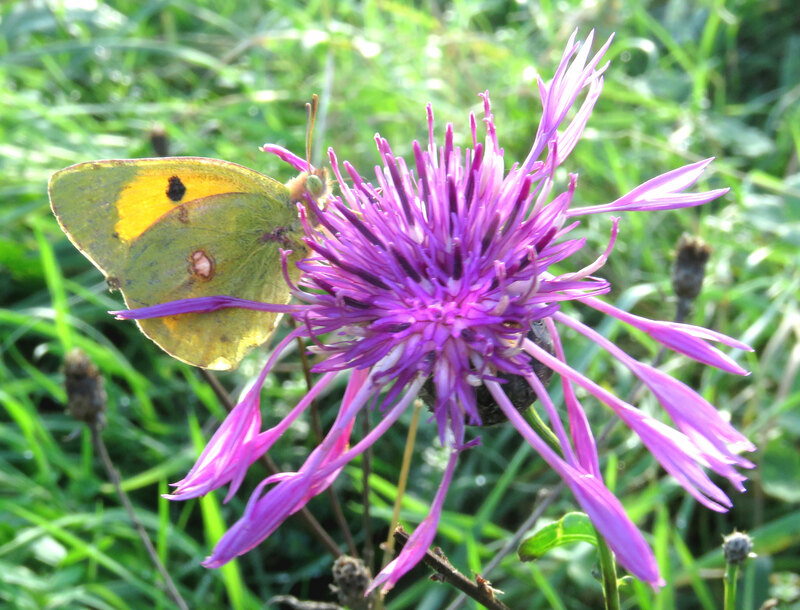 A Clouded Yellow fluttered rapidly over the lower slopes without pausing. Meadow Browns numbered nearly as many as the Chalkhill Blues on the lower slopes and more on the whole of Mill Hill as I only saw one additional Chalkhill Blue above the ridge. 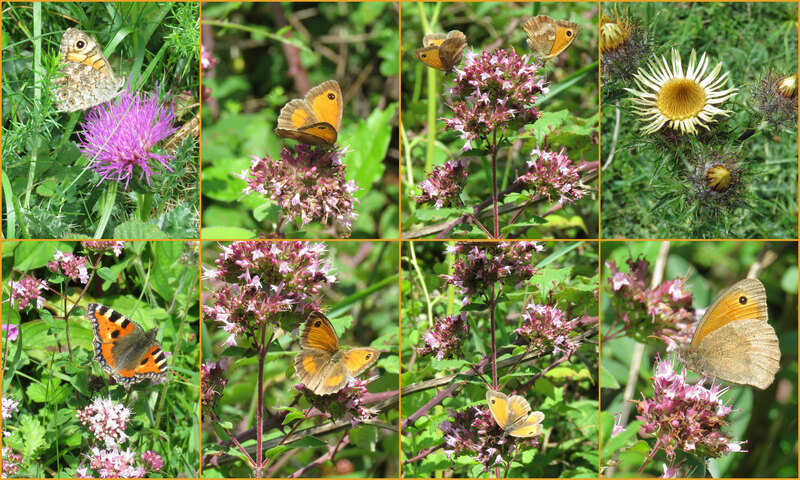 Gatekeepers were very frequently seen and the most numerous (80+ altogether seen) on both the lower slopes and the middle slopes where they were attracted to Marjoram, which also enticed a Small Tortoiseshell (one of two) to visit for nectar. Buddleia proved attractive to occasional Red Admirals, a Peacock and a Painted Lady. Male Common Blues were occasionally seen on the lower slops but frequent on the top of the hill, especially so in the meadow north of the car park where I also spotted a Small Copper, an unmistakable Brown Argus, and a Large White. 6-spotted Burnet Moths and Silver Y Moths occasionally attracted my attention as well as a definite small pyralid moth Pyrausta purpuralis on Marjoram. The Robber Fly, Machimus atricapillus, was spotted amongst some fresh blackberries. 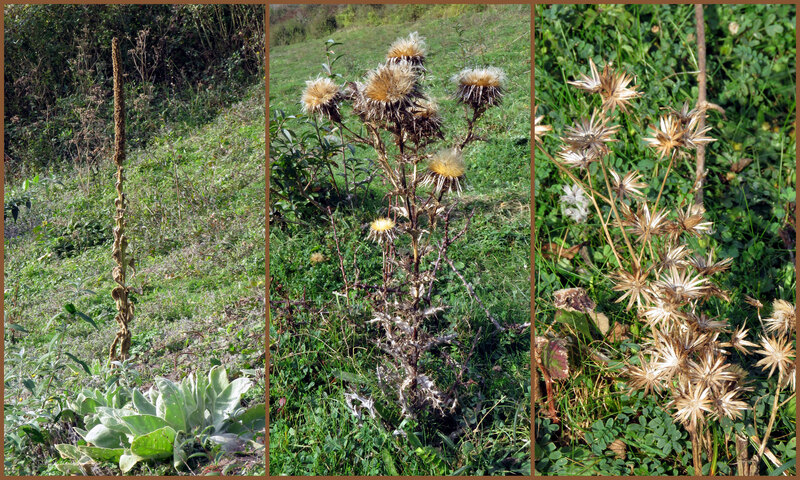 Carline Thistle was seen in flower for the first time this year. There were also at least three large white mushrooms, with a stem ring and a diameter of at least 65 mm and thought to be White Dapperling, Leucoagaricus leucothites. On a cloudy day I visited the lower slopes of Mill Hill where I fought my way through the invasive Privet to complete a 90% transect registering a count of 21 male Chalkhill Blues and if I was to include the southern part of the top of the hill they were exceeded by both Common Blues and Meadow Browns, and these were exceeded by 6-spotted Burnet Moths. The lower slopes also hosted at least one Large White Butterfly, a pristine Small Tortoiseshell, frequent Small Heath Butterflies, and a Treble-bar Moth. I returned by the ridge route and noted a Peacock Butterfly over the path through the scrub and the distinctive hoverfly Chrysotoxum bicinctum by the Reservoir. This hoverfly Chrysotoxum bicinctum is widespread and has been found in north Shoreham, Lancing and Steyning by me before but I had not seen it on Mill Hill. Gatekeepers were frequently seen by the bushes on Mill Hill. 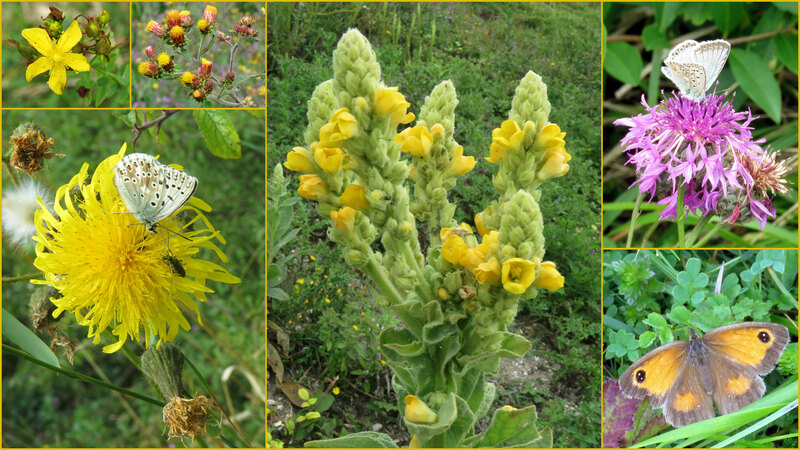 Great Mullein were a relatively new noticeable feature on the disturbed land on the northern end of the lower slopes of Mill Hill, the yellow flowers had now appeared on the tall stem, which rises from the large rosette of leaves. More Ploughman's Spikenardwas flowering in large groups on the lower slopes with more budding Carline Thistle. And my change of route back via the ridge route added more Musk Thistles, Spear Thistles, Creeping Thistles, and Welted Thistle to the widespread Dwarf Thistles. Perennial Sow Thistle was noted by me for the first time on Mill Hill by the southern steps. The small umbellifer Upright Hedge Parsley Torilis japonica was identified for the first time. 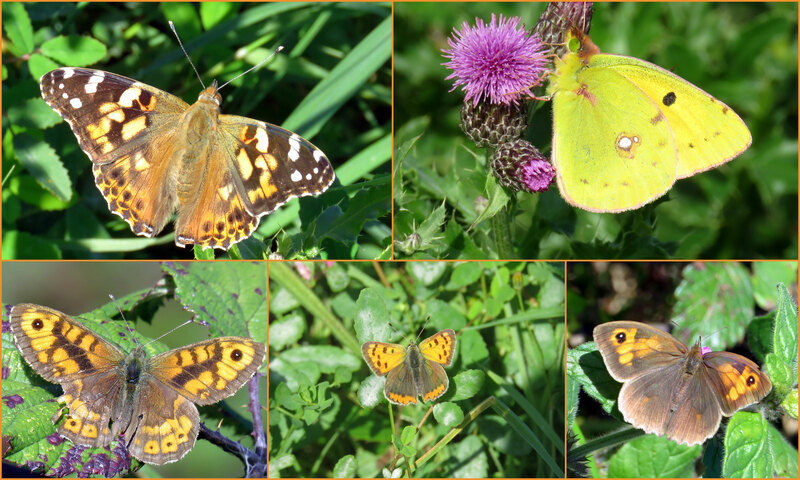 Butterflies were fluttering all over Mill Hill with sixteen of the expected species. 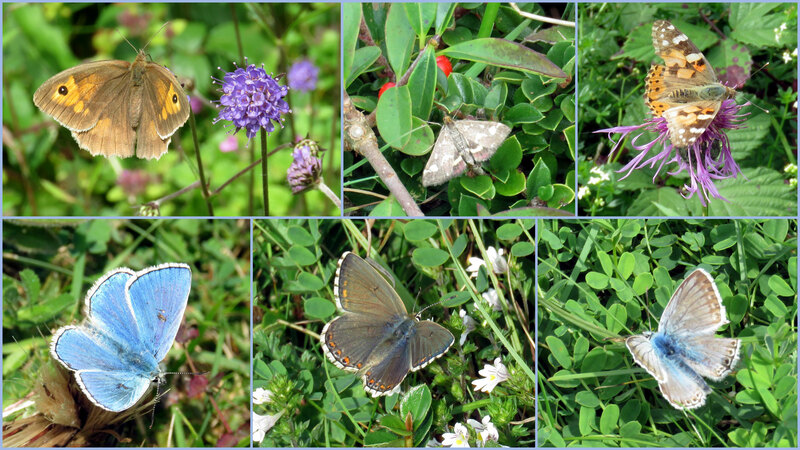 Common Blues (100+) were all over the top of the hill where I spotted a Brown Argus almost immediately. 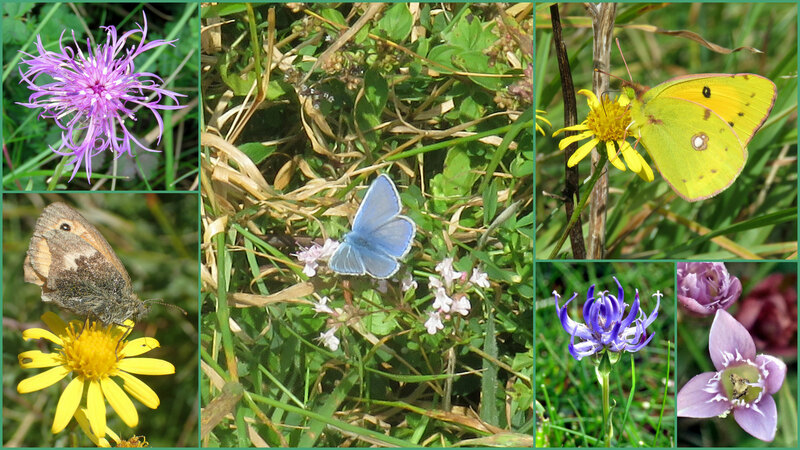 Chalkhill Blues (55+) were widespread with most over the lower slopes where I was pleased to see my first Clouded Yellow of the year. Carline Thistle was budding on the lower slopes. On the upper plateau of Mill Hill I recorded my first Round-headed Rampion flower of the year. This flower is easily overlooked. Not so the Musk Thistle where I made a quick search and found my first of this flower of the year when most of the plants had already gone to seed. 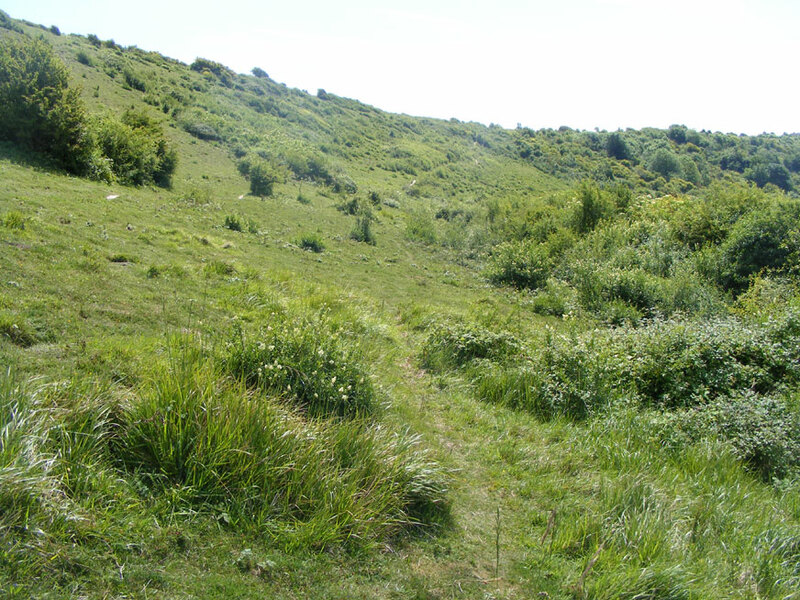 My first Ploughman's Spikenard was also spotted on the ridge rather than the lower slopes. I spotted my first ever pyralid micro-moth Mint Moth Pyrausta aurata on the middle slopes of Mill Hill, visiting Marjoram. Also, the hoverfly Chrysotoxum festivum was found in the same area on Wild Parsnip and other flowers. On the southern part of Mill Hill, I noted quite a few Meadow Browns, a Comma and Silver Y Moths. On the steps down to the lower slopes a Speckled Wood showed in the shade before I was distracted by a Peacock and my first Painted Lady of the year. Scores of butterflies fluttered around on Mill Hill including my first dozen or so of the first male Chalkhill Blues of the year over the lower slopes. On a warm sunny afternoon, all the butterflies were extremely lively especially over the large patch of Wild Basil at the northern end of lower slopes where they were joined and disturbed by frequent Small Heaths, Gatekeepers, male Common Blues and Marbled Whites., a couple of Brimstones, a Red Admiral, a Small White, and a Large White. I only visited the northern end of the lower slopes for under an hour. From the path I also spotted lots more Meadow Browns and Marbled Whites, Gatekeepers and 6-spotted Burnet Moths as I returned hurriedly. Robin's Pin Cushion was spotted and the yellow Lesser Hawkbit identified on the lower slopes. I did manage to add a brownish Small Skipper to the list amongst the Greater Knapweed and many grasses south of the Reservoir. A rustle in the dense but very short vegetation on the lower slopes of Mill Hill was recognised with a clear view of a Common Lizard, Zootoca vivipara, which may have been after a Meadow Grasshopper, Chorthippus parallelus. Some vegetation like Privet was alarmingly everywhere blocking off half the lower slopes, whereas other flowers like Marjoram, the tall Great Mullein, Wild Mignonette, the diminutive Squinancywort, Dwarf Thistle, Wild Basil, Field Scabious, Small Scabious, were attractive natives coming into bloom. 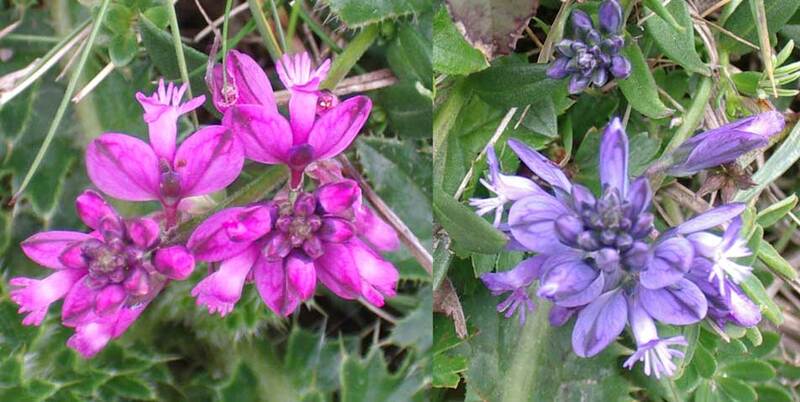 Welted Thistle was seen on the ridge, but Musk Thistle seems to have disappeared and likewise Meadow Cranesbill. 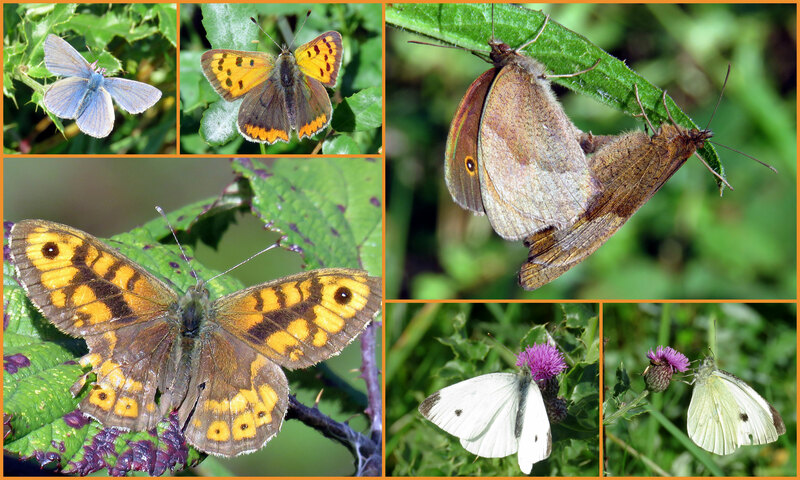 Meadow Browns (50+) were all over Mill Hill and Marbled Whites (25+) were frequent too, but there were not many butterflies for summer and not many species, frequent fresh Gatekeepers, an occasional Small Heath a few Large Whites and Small Whites. Looking out for blues, I disturbed a Treble-bar Moth and a Silver Y Moth, and spotted a 6-spotted Burnet Moth. 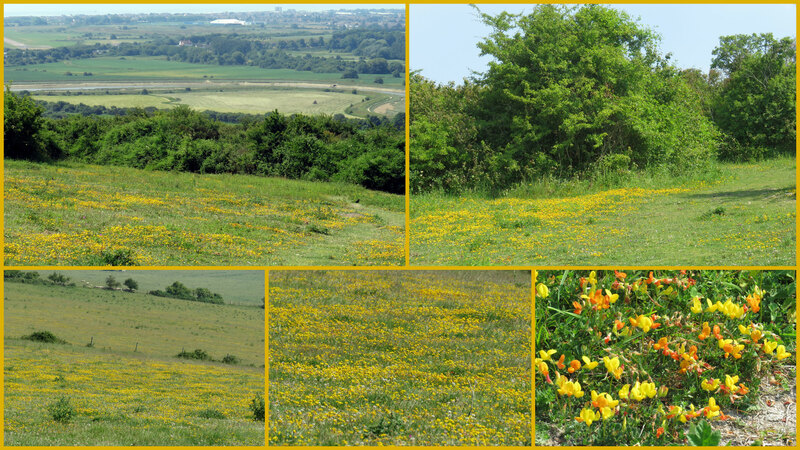 The chalk downs above Shoreham were swathed in the yellow of Bird's Foot Trefoil, on the middle slopes of Mill Hill and New Erringham pasture to the east of Mill Hill Nature Reserve. A Rook soared like a Buzzard in the mostly blue sky on the warmest air temperature of the year reaching 25.6 °C at 10:00 am and 26.1 ° C at 11:00 am when I was on Mill Hill. Butterflies were very frequently seen but not much variety, twenty five or so Meadow Browns amongst the long vegetation on the top part of Mill Hill south of the Reservoir with many more wall hidden with at least one, probably more, Silver Y Moths. On the Privet covered lower slopes, the lively Marbled White Butterflies (18+) merged well with the flowerheads of the invasive Privet bushes, Small Heath Butterflies (18+) courted in the gaps between the bushes with a few male Common Blues and one Small Tortoiseshell on my less than one acre transect walk. Frequent tiny pyralid moths Pyrausta puperalis, flitted amongst the low herbs. Grasshoppers were stridulating in the sunshine. At lest one ws the Common Green Grasshopper, Omocestus viridulus. There were at least a dozen Meadow Browns, half a dozen Small Heaths, and another four Marbled Whites on my passage return over the middle and top part of Mill Hill north of the Reservoir. Add to my tally a Brimstone, Comma and three more Small Tortoiseshells on the fringes of the scrub. The morning flowering Yellow Wort was both attractive and common, possibly as many as I had ever seen before on both the lower and middle slopes where the soil is shallow and undisturbed. There was the yellow of the upright Rough Hawkbit and Mouse-eared Hawkweed, and the ground hugging Silverweed on and around the ridge. Vervain was noted for the first time next to the path, and the diminutive Eyebright had been flowering for sometime but not previously mentioned. A handful of Pyramidal Orchids were seen scattered around as single spikes. 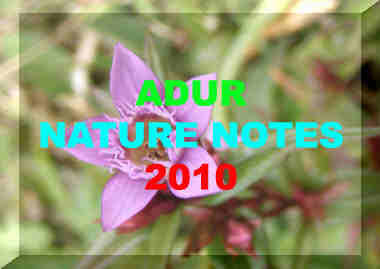 This was found with Knapweed on Mill Hill, but I am not sure which species? I think it is Knapweed Broomrape from previous records compared. 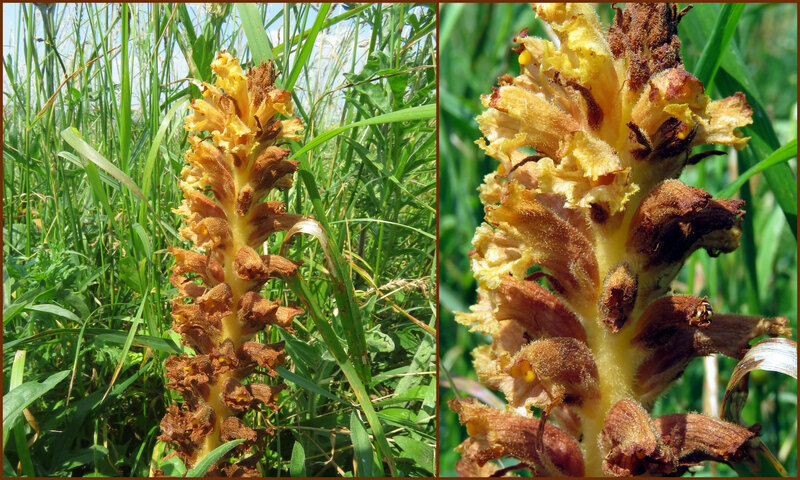 Lastly, I eventually found some Knapweed Broomrape after a search on the southern top part of Mill Hill. At last the breeze was gentle (Force 3) on a sunny humid day. 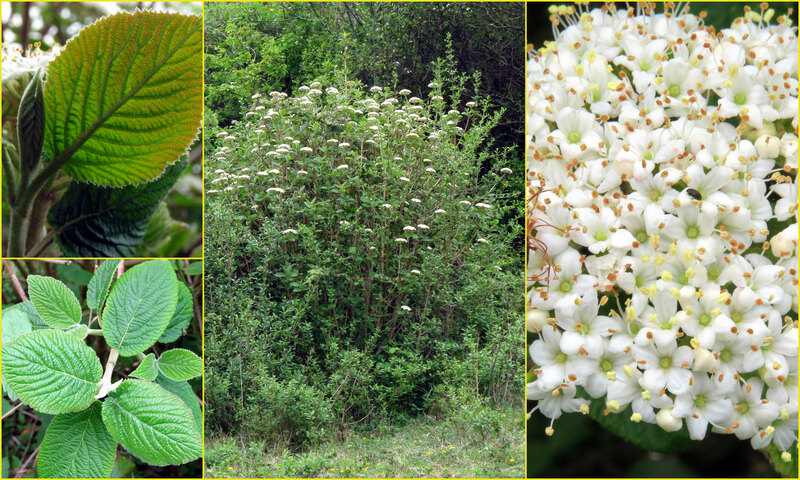 The white flowers of Elderflower, Privet and Bramble were dominant in the landscape. 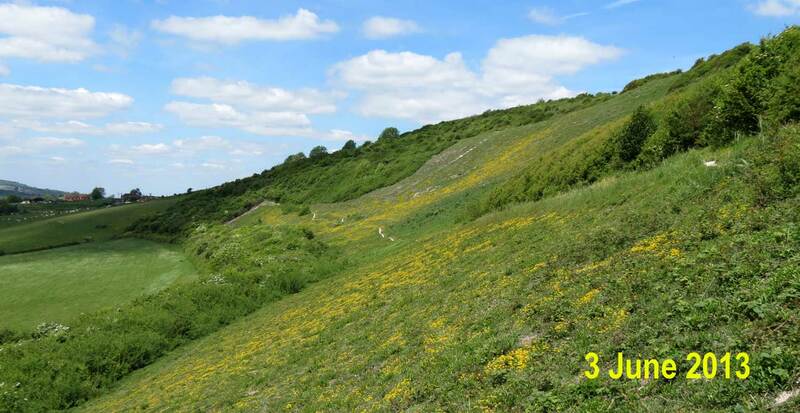 Privet threatened to overrun the lower slopes of Mill Hill and certainly blotted out many of the Dropwort flowers. 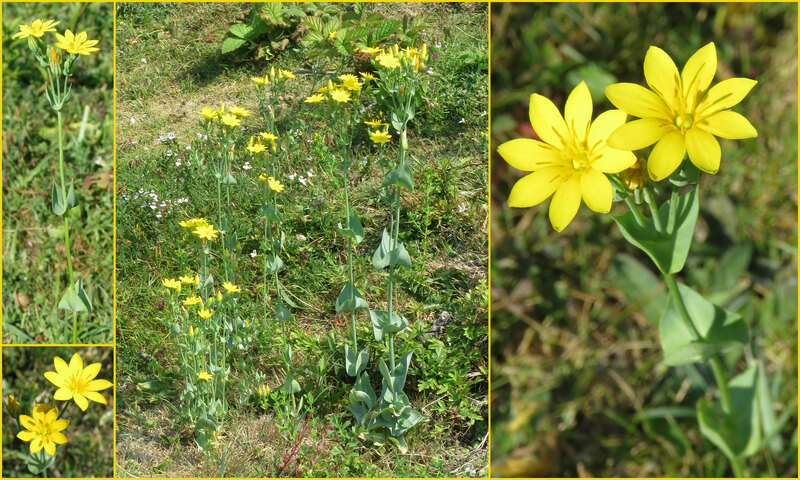 In the bare patches Yellow Wort opened its flowers in the morning. On the southern top part of Mill Hill I stumbled across a Small Tortoiseshell, a pale green Brimstone and a male Common Blue Butterfly in the late morning. On the lower slopes the flowering Privet had grown up so much that I did not complete my normal transect walk and just made a cursory unhurried visit. Brimstone Butterflies patrolled as usual and one pair was courting. Frequent Small Heath Butterflies were harder to spot because of the excessive Privet, with occasional larger Meadow Browns and some blue butterflies. There were a handful of battered and ragged blue butterflies. I have a tendency to think that at least four were the surviving remnants of the first batch of male Adonis Blues. I disturbed about seven Cinnabar Moths which was an unprecedented number in a hour. A pale Silver Y Mothsettled in front of me. The pyralid micro-moth Pyrausta despicata was spotted occasionally on the lower slopes of Mill Hill. A Peregrine Falcon made three passes at a Buzzard over the southern steps on Mill Hill, before both birds of prey flow off on a windy late afternoon. On the same day the Buzzard descended and caught a Rabbit which it flew up with, only to be mobbed by a Crow. 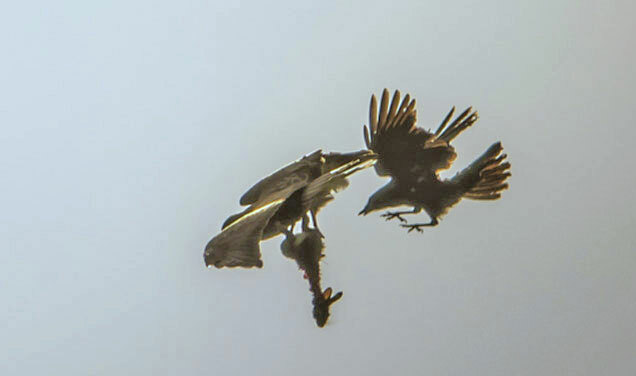 On the same day the Buzzard descended and caught a young Rabbit which it flew up with, only to be mobbed by a Crow. 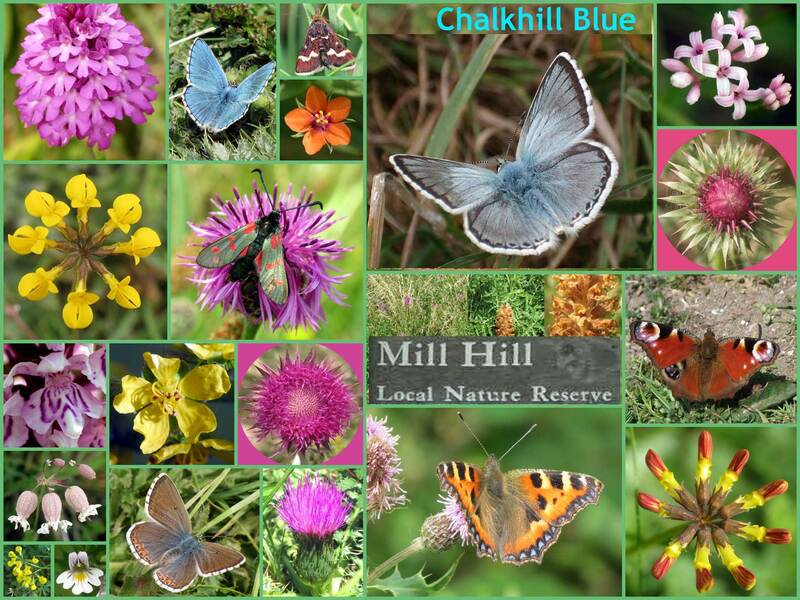 My Mill Hill transect produced Adonis Blue 28, Brimstone 2, Peacock, Red Admiral, Small Heath 19, Small Tortoiseshell 3. 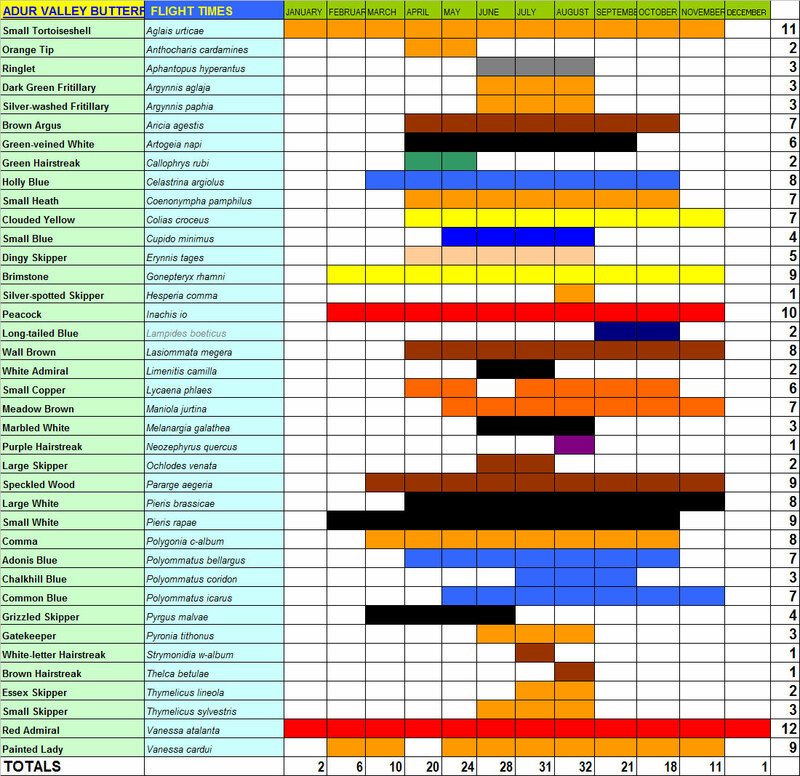 Moths: Cinnabar (Tyria jacobaeae) 3, Burnet Companion (Euclidia glyphica), Common Purple and Gold (Pyrausta purpuralis), Hook-streak Grass veneer (Crambus lathoniellus), Lesser Treble-bar (Aplocera efformata). On the lower slopes of Milll Hill, I tried to count the Adonis Blues in the designated one acre transect area (which now takes me half an hour to traverse if I do not pause) but at the count of 91 (including seven females), the numbers were too many together at the northern end to get an accurate count but estimated at 125 in the acre (10% females). They were accompanied by frequent Common Blues which almost all appeared to be males. A few Adonis Blues mated. 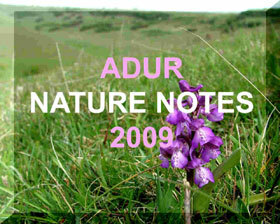 Others were chased by the frequent amorous Small Heaths. Brimstone Butterflies were incessantly on patrol, although one did visit a Bramble flower. Two Dingy Skippers courted and one was seen alone. They were drabber than a Mother Shipton Moth of the same size and similar behaviour. A Peacock Butterfly flew overhead and was seen to be intact when it later landed. The most distinctive find were three Cinnabar Moths which quickly disappeared into hiding. Altogether there was not much variety which included a single Green-veined White. 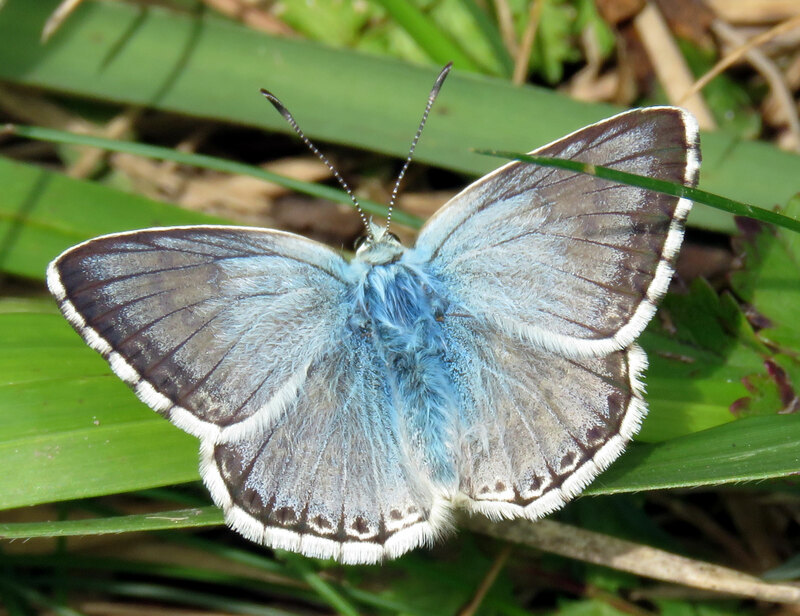 I only visited the lower slopes of Mill Hill, but access was over the top southern part and it looked as though there may have been a late in the day emergence of Common Blues as they were occasionally disturbed on passage. 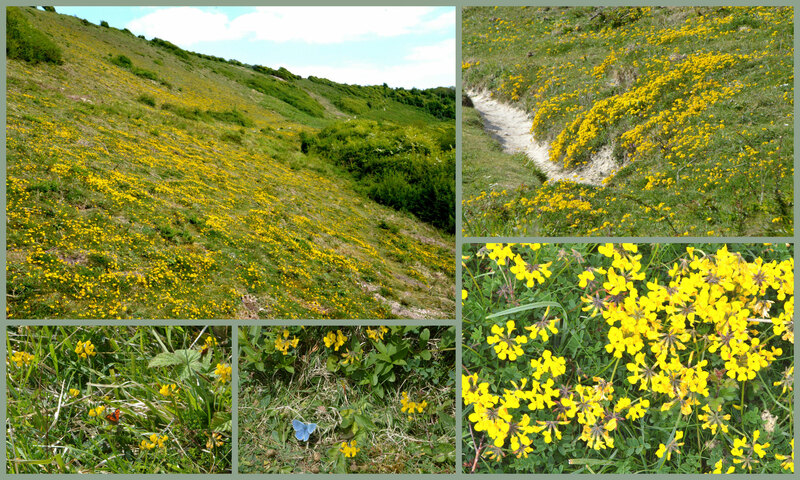 Horseshoe Vetch, Hippocrepis comosa, abundantly covered the slopes but thousands of flowers were withering to seed. The first Dropwort buds and tiny flowers were on show, and I spotted a miniature Fairy Flax. The hoverfly Merodon equestris and theThick-legged Flower Beetle, Oedemera nobilis, visited Bramble flowers. Looking up on occasions to the blue sky, there were no birds of prey to be seen. I saw what may have been the white rump of a Wheatear flying over the lower slopes as I was leaving by the southern steps. As a weak sun was shining, I made a quick visit to the upper part of Mill Hill, where a female Adonis Blue landed on the path in front of me just above the ridge. Occasional Brimstones were the most prevalent butterfly in the late morning fluttering strongly around the scrub, where I was surprised to see a lively female Holly Blue. Small Heath Butterflies fluttered around in the shorn vegetation. Other butterfly visitors commented on the dearth of butterflies on the top of Mill Hill although they could add two Small Coppers and some Common Blues to my tally. 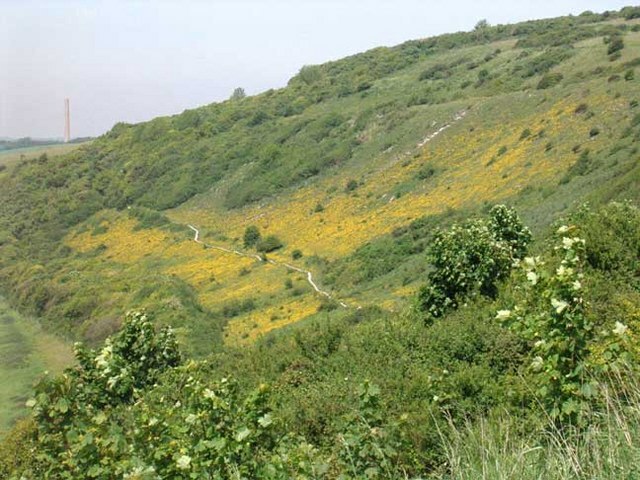 Mill Hill was covered in glorious swathes of the yellow of Horseshoe Vetch, Hippocrepis comosa, flowering the slopes, mostly the steep slopes and lower slopes but also some quite large patches on the upper part of the hill. 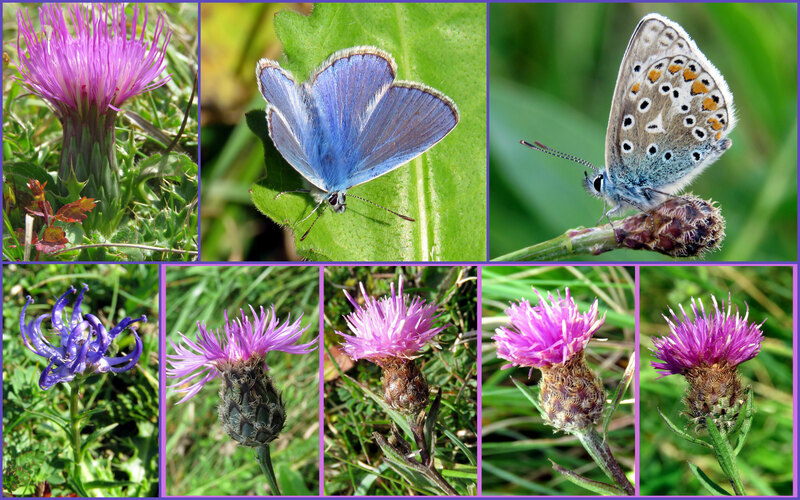 Butterflies were common (over a hundred) for the first time this year with male Adonis Blues leading the way with sixty plus and a few flighty females. About twenty male Common Blues were seen for the first time this year with frequent Brimstone Butterflies, frequent Small Heaths, just two Grizzled Skippers, and one of each of Dingy Skipper, Peacock, Speckled Wood, a first of the year Wall Brown, Red Admiral, and a Green-veined White. That made for eleven different species, the most this year in over an hour on Mill Hill, and it was only sunny for some of the time and one cloud let loose a few drops of rain. 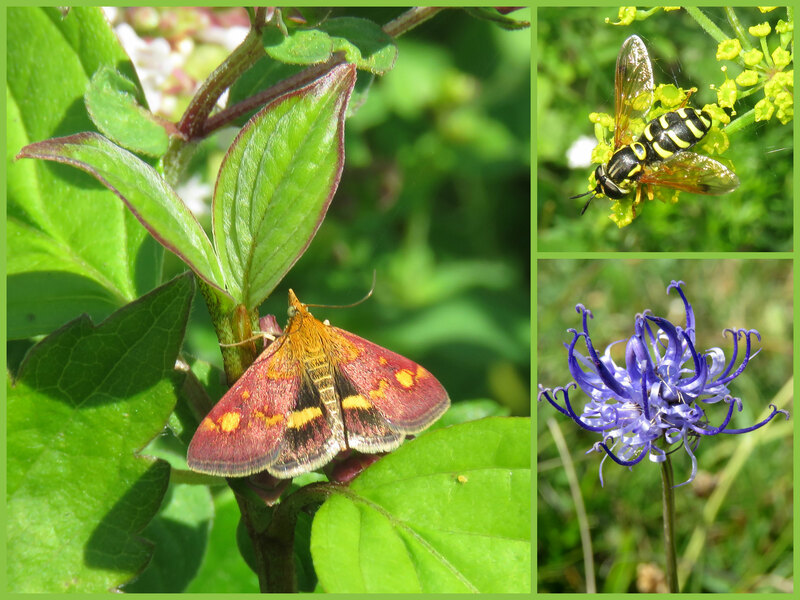 I also spotted a Treble-bar Moth and my first of the year pyralid micro-moth Pyrausta nigrata. Graeme Rolf also spotted two Green Hairstreaks and three Cinnabar Moths. The small beetle Isomira murina was recorded for the first time. Summer seemed to have put in its first appearance with the glorious blue of my first male Adonis Blue Butterfly of the year. 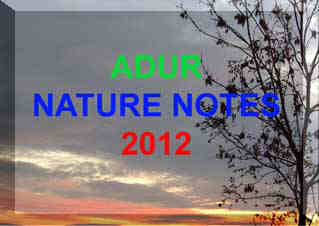 It appeared on the lower slopes of Mill Hill at 3:00 pm with the sun still behind the fluffy cirrus clouds. It was the first of about ten, nine in perfect condition, but one slightly torn and ragged. 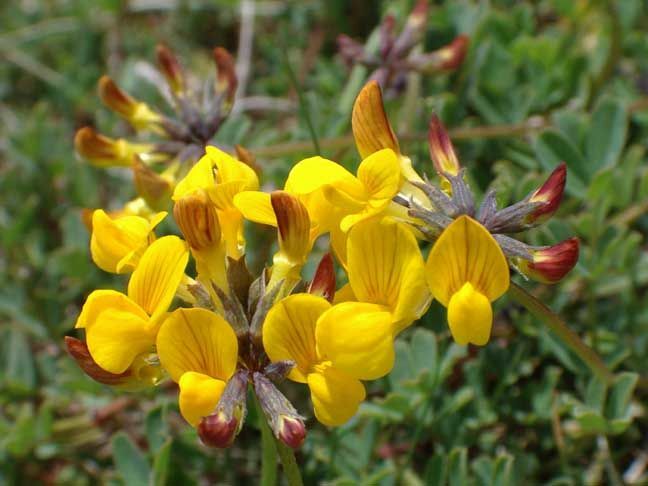 Swathes of the bright yellow flowers of the Horseshoe Vetch, Hippocrepis comosa, covered the slopes. 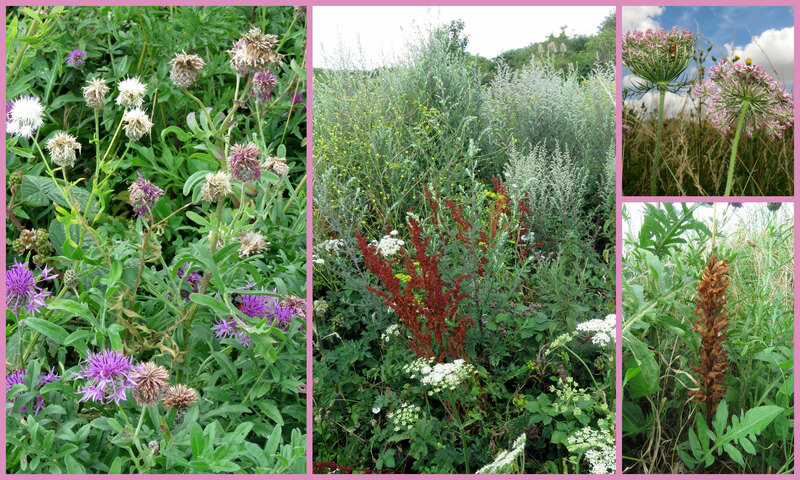 This vitally important butterfly food plant was virtually at is peak flowering. I noted a couple of Dog Violets amongst the yellow exuberance. Two Green-veined White Butterflies, three bright yellowBrimstones Butterflies, a worn Peacock Butterfly and the first of the dozen or more Small Heath Butterflies showed after five minutes or so. A flash of bright crimson was my first Cinnabar Moth of the year. My first damselfly of the year, a Large Red Damselfly, flitted around the short vegetation. 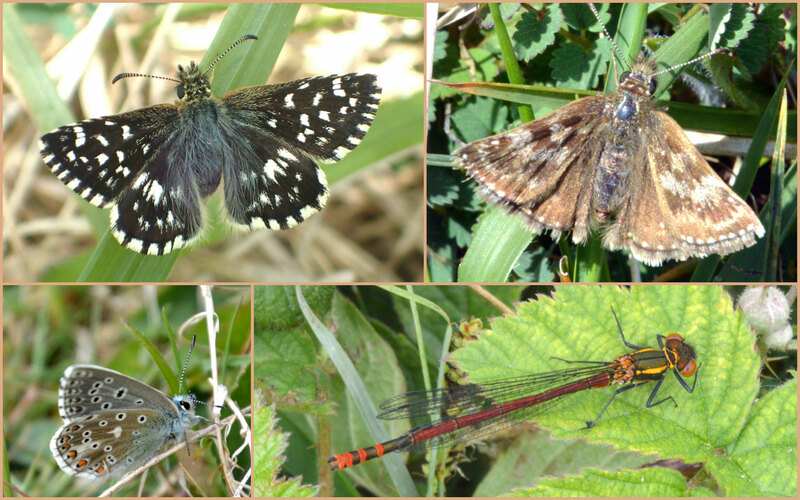 Nine species of butterfly were seen on Mill Hill, but I had to wait around for an hour before a spell of sunshine enticed a veritable flurry of activity and the appearance of the skippers, including my first of only a few (maybe just one or two seen several times) Dingy Skippers of the year. Grizzled Skippers were discovered mating on a Bramble shoot. A flash of orange was a surprise Small Copper Butterfly which was another first for two years. A Red Admiral was seen at the top of the southern steps as I left after an hour and half. The first shoots of Yellow Wort were spotted. Too breezy for photography, too cool for butterflies, and my days are numbered for scrambling about on steep hillsides. 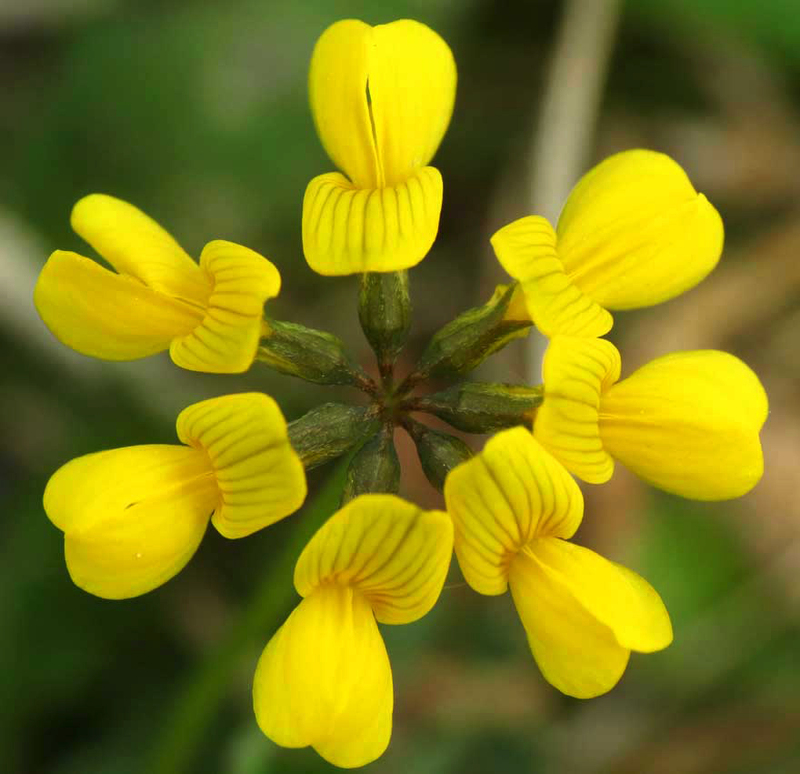 Nevertheless the Horseshoe Vetch, Hippocrepis comosa, was flowering in abundance on he lower slopes of Mill Hill with most yet to burst out into full bloom. Three Swifts darted to and fro over the upper plateau at great speed, possibly feeding on small flies. Half a dozen or more Jackdaws were attracted to the steep slopes amongst the Horseshoe Vetch (corvids seen at this time of year more often than not), joined by a few Crows and Magpies. At least one of the Jackdaws was collecting nesting materials of small dried grasses and sundries of which there was plenty on the slopes. Red-tailed Bumblebees and Honey Bees were frequently seen visiting the Horseshoe Vetch. And I stayed long enough to record three Peacock Butterflies on the edges of the scrub on the middle slopes, three Grizzled Skippers on the lower slopes followed by my first Small Heath Butterfly of the year. Hounds-tongue was very frequently seen on some cleared ground above the winding footpath through the lower slopes, and just one Mouse-eared Hawkweed by the gate to Old Erringham pastures. 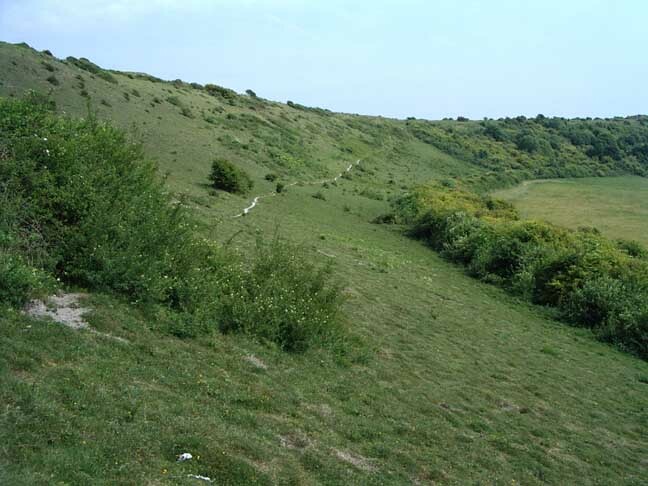 No Violets were casually spotted on the lower slopes, but frequent Milkwort was on the upper plateau (immediately south of the upper car park) scattered with more Horseshoe Vetch. 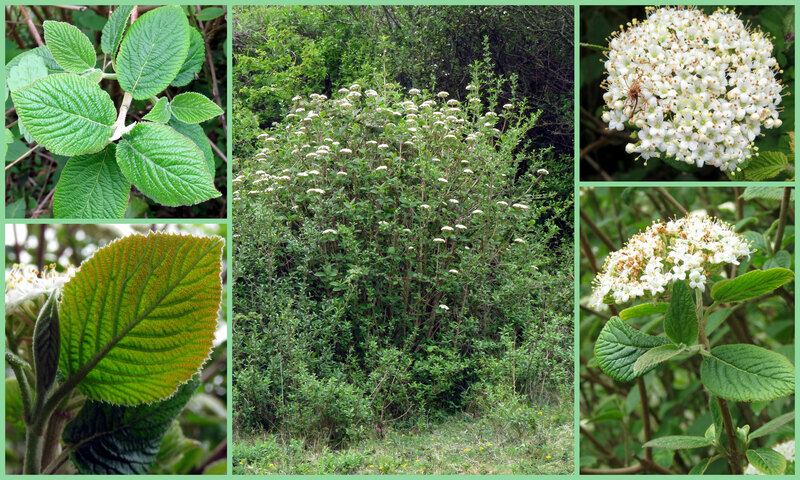 One Wayfaring Tree bush was in blossom at the northern end of the lower slopes on Mill Hill. Birds were in good voice from the bushes. I think I recognised the song of a Chiff-chaff. 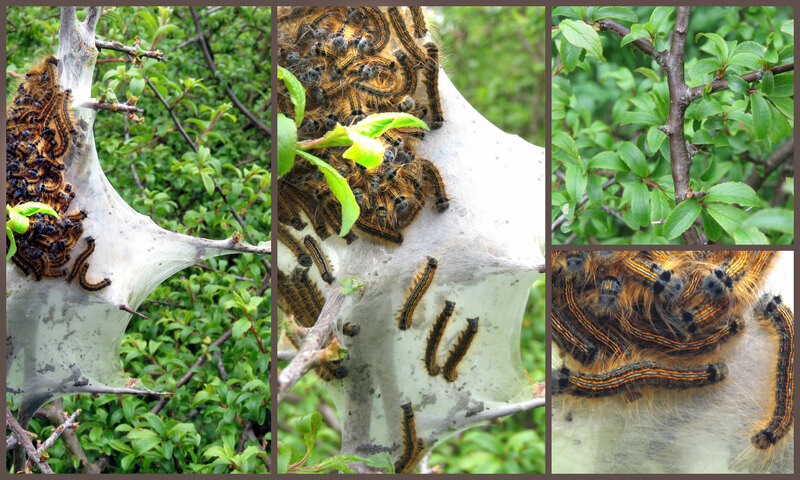 Lackey Moth Caterpillars in their silken tent on Blackthorn on the upper part of Mill Hill, with Slow Worms, both found south of the Reservoir on a rainy day. At Mill Hill, to help find some roosting Grizzled Skippers. By now everything was asleep, but a careful search of the scrub revealed 5 snoozing Grizzled Skippers, 2 dozing Dingy Skippers, 3 sleepy Small Heaths and a comatose Brown Argus (which may be a national first for the year). I walked Mill Hill late morning in the fading 'grey' sun and in the sheltered areas out of the cool easterly breeze at the bottom of the steep slope, I counted at least 12 Grizzled Skippers, 10 Dingy Skippers, 3 Small Coppers, 4 Small Heath and one very fresh and surprisingly sprightly Adonis Blue that wouldn't pose long enough for a picture. 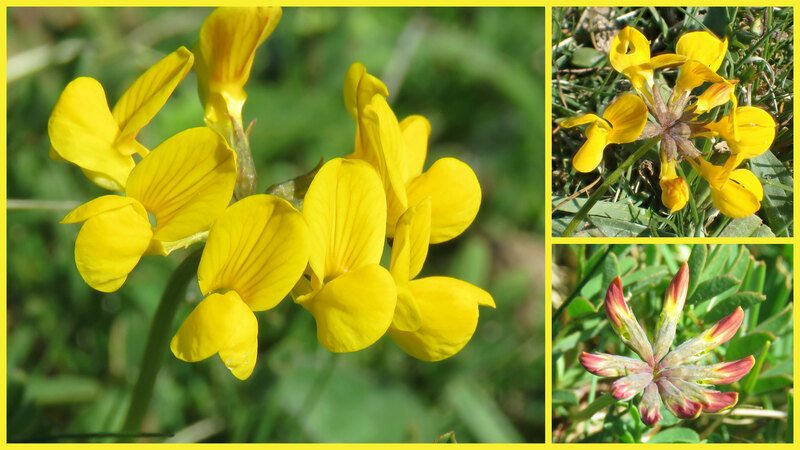 On the lower slopes of Mill Hill, the first hundred or so flowers of Horseshoe Vetch, Hippocrepis comosa, were showing along with the the first flowers of Milkwort. Young Privet was everywhere over the southern part of the lower slopes. coming back vigorously every year and threatening to shade out the chalkhill plants. There was not much to see: a group of five Rooks, Slow Worms and a Common Lizard on the top part. On the lower slopes two Peacock Butterflies and two Grizzled Skippers were reluctant to settle within camera range. I spotted a worn small pyralid moth Pyrausta despicata, and frequent micro-moths Pancalia leuwenhoekella and many small spiders running in the short vegetation. Pyrausta nigratawas not seen. Two Common Bee-flies hovered around the lower slopes. It was cold and cloudy at Mill Hill this morning with nothing flying but eventually the sun came out for a few minutes and I managed a picture of a Green Hairstreak. The wings look slightly crumpled so maybe they weren't quite dry (though it was able to fly). Noticing it was warm and with half an hour to kill before lunch I popped up to Mill Hill. I had been on the slope less than 15 seconds when a Small Heath settled on the grass beside me. There were also plenty of Grizzled Skippers. This was the first sighting of a Small Heath for Sussex. I accidentally caught an Adonis Blue, Polyommatus bellargus, larva complete with it's attendant ant while trying to scoop up the spider! I was amazed, what a find! I knew they were there, and I knew others had seen them but I never expected to find one myself. 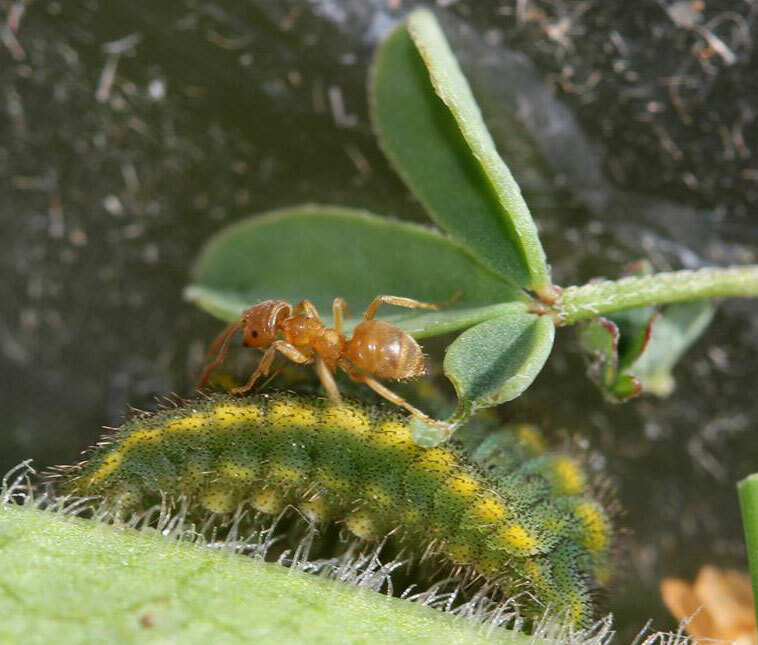 The ant in the photograph is probably the Meadow Ant, Lasius flavus. 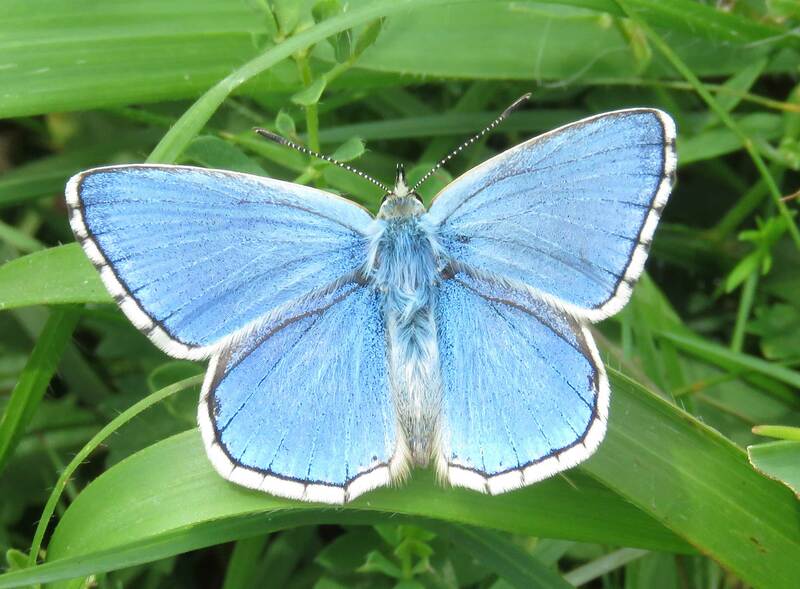 There is no certainty that the caterpillar is the Adonis as it could be the Chalkhill Blue. 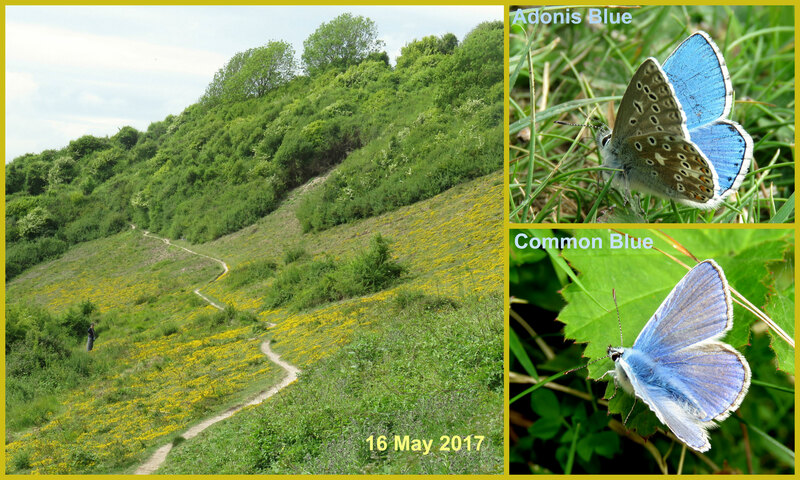 Because of the date I think the Adonis Blue is much more likely. A pair of Holly Blue Butterflies fluttering high in the trees at the top of Chanctonbury Drive, north Shoreham, were my first of the year. 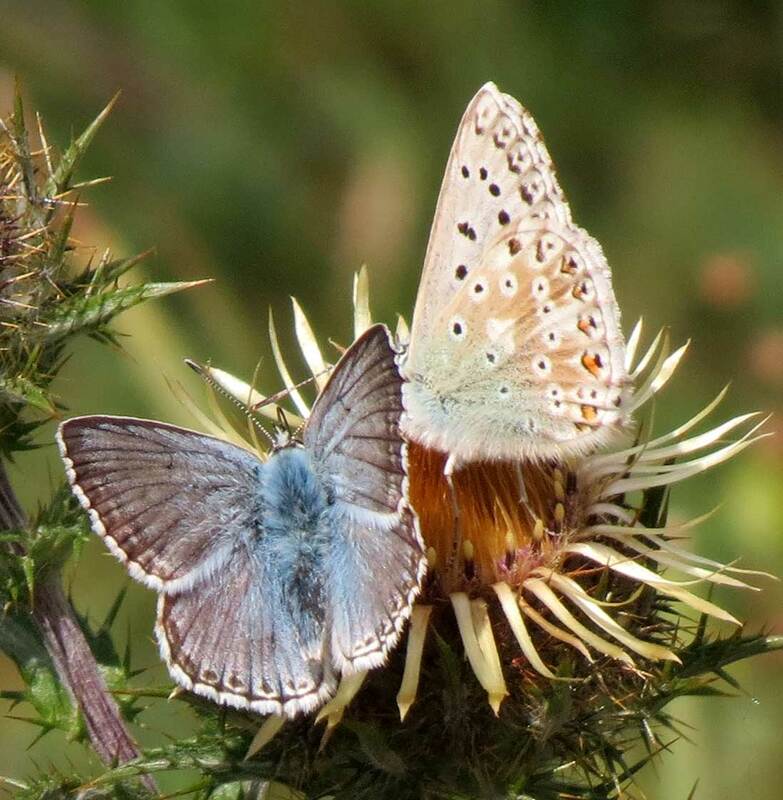 This is on the way to Mill Hill, where the highlight on the lower slopes was another first of the year: a pair of mating Grizzled Skippers on a dead Carline Thistle plant. Dog Violets were now the dominant violets on the lower slopes. On a hazy late afternoon, there was not much movement, my first Swallow of the year flew over the Blackthorn in blossom, a Kestrelhovering and descending on ot the steep slopes, a handful of Peacock Butterflies and a Small Tortoiseshell, the fattest Slow Worm I have ever seen, Common Bee-flies, bumblebees, small hoverflies, and frequent active small Alopecosa spiders crawling amongst the short vegetation. At least two species of micro-moth flitted around in amongst the short herbs, including occasional Violet Cosmet Moths, Pancalia leuwenhoekella. At least 2 Grizzled Skippers have emerged on Mill Hill. 3 Brimstone, Small White, Green-veined White, Small Tortoiseshell, Comma and several Peacock in half hour walk at lunchtime today. I went back to Mill Hill with Chris Corrigan. There were plenty of micro moths including a number of Small Purple and Gold. I also saw a Toad and a couple of Common Lizards. 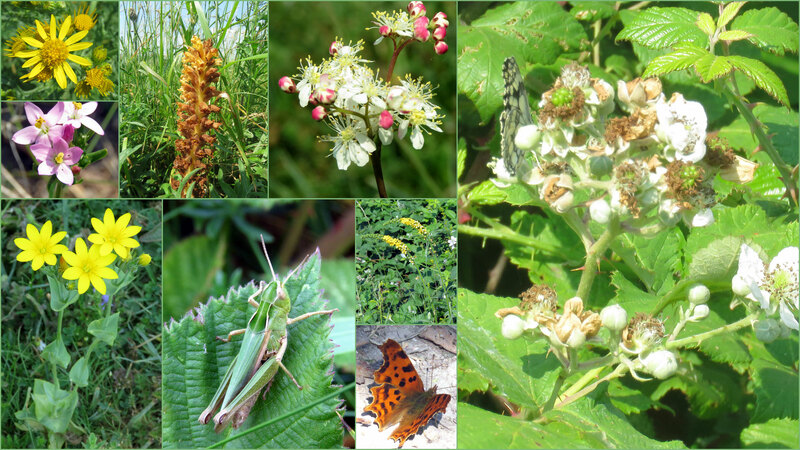 There were butterflies about including Brimstone, Peacocks, Small Tortoiseshells, Speckled Woods and a single Red Admiral. About ten minutes after I had abandoned all hope, I caught sight of a Grizzled Skipper out of the corner of my, sitting on vetch. It was amazingly vivid so had probably just emerged. Unfortunately in the fumble for my camera I took my eye off butterfly and it was gone. Half an hour of searching failed to find it again. Fortunately, some time later Chris spotted a second one just six feet in front of the spot Neil had deemed propitious. This was the earliest sighting of a Grizzled Skipper in England for 2017. A large bird of prey (Peregrine?) soared and rose of the thermals over Mill Hill on a sunny but breezy (steady Force 5) afternoon. 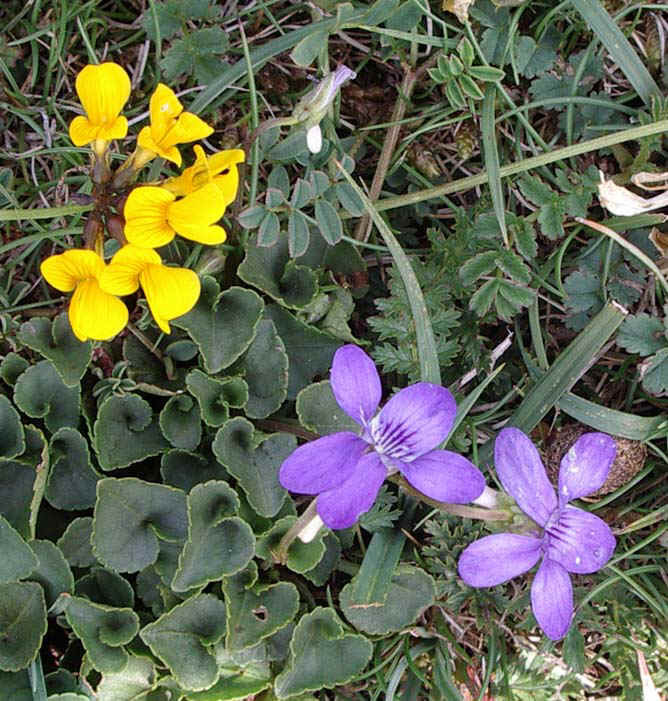 The Dog Violets were already flowering on the lower slopes, in roughly equal numbers with Sweet Violets. A Common Bee-fly buzzed around the lower slopes, which were sheltered from the easterly breeze. Peacock Butterflies were courting high into the blue sky. After the falcon had flown away a Skylark could be heard but scarcely seen, . I cycled to Mill Hill, where a Peacock Butterfly put in appearance over the pasture north of the Bridge, east of the road followed by a Comma Butterfly. 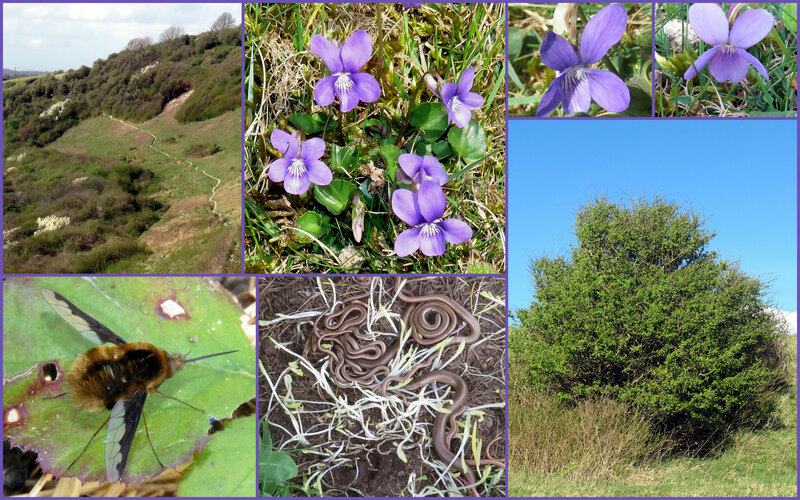 Only a few Sweet Violets were scattered over the lower slopes of Mill Hill, so I ventured not much further than the southern steps, but I spotted a handful of Peacock Butterflies in as many minutes. 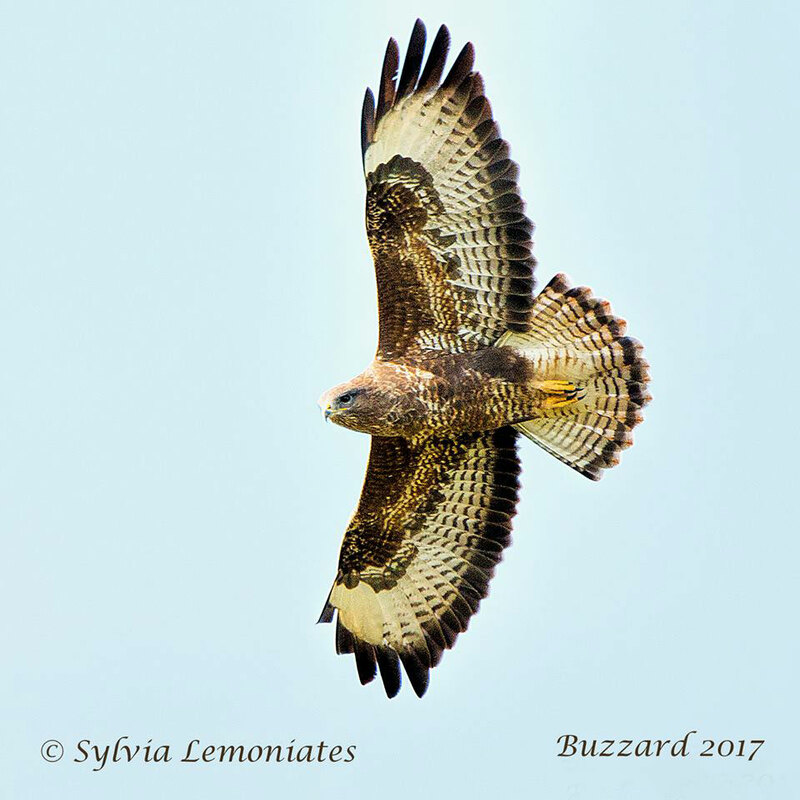 A Buzzard soared over Mill Hill where I also found my first Slow Worm of 2017. A Buzzard soared over Mill Hill. The sun came out and the air temperature measured 14° C at its highest at 4:00 pm. A Crow mobbed a small (male?) Kestrel high over the ridge. A clump of Daffodils was flowering. One was confirmed on Mill Hill in 2017.